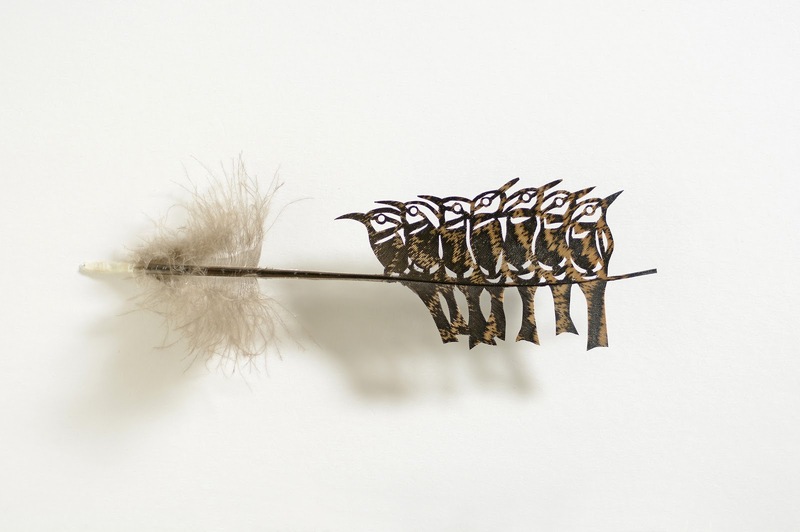 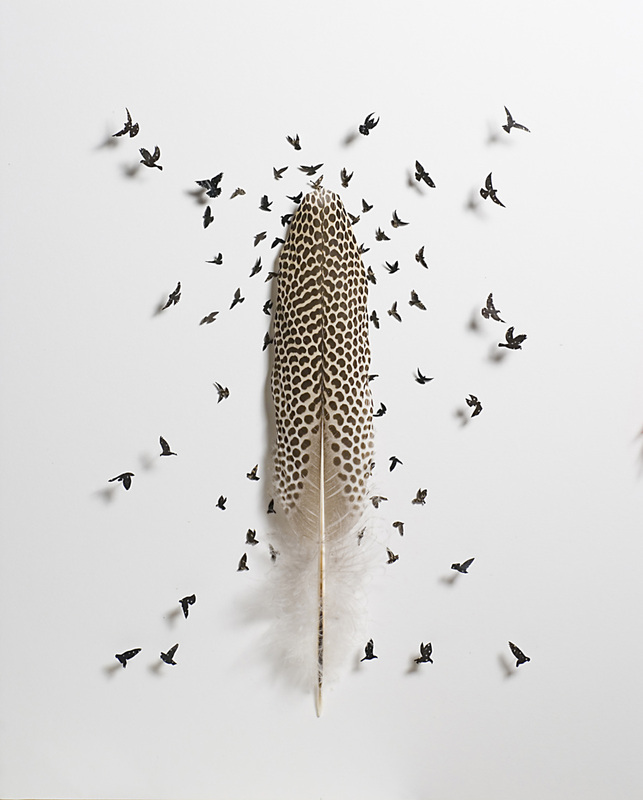 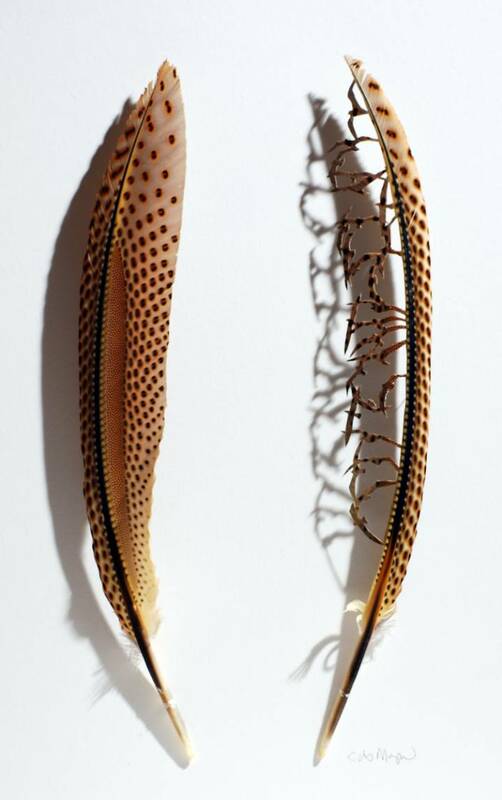 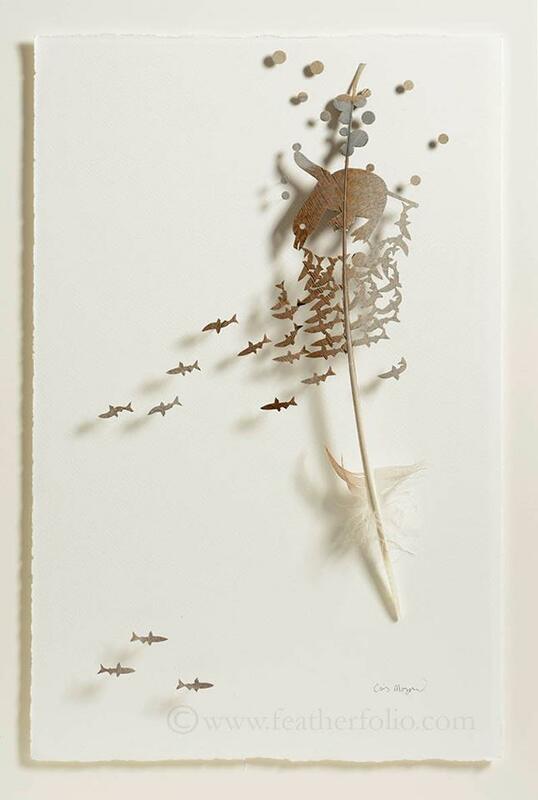 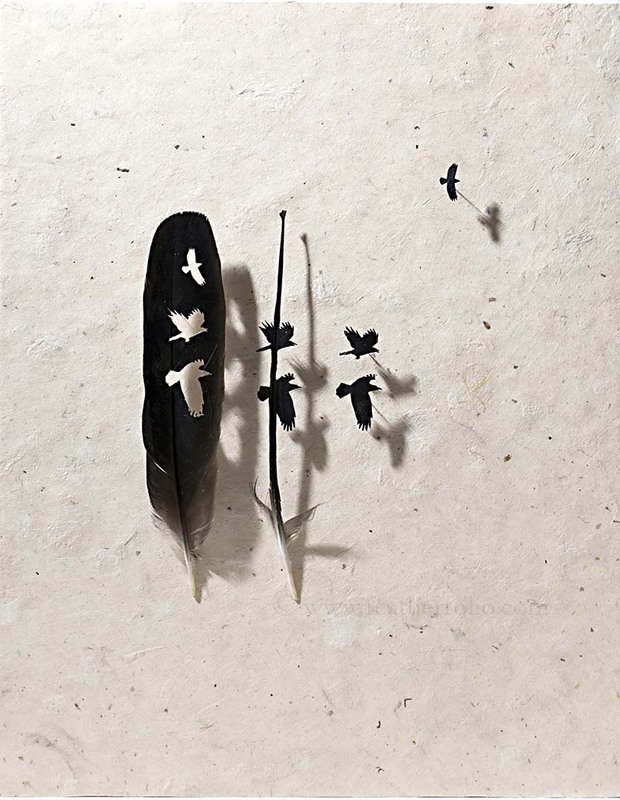 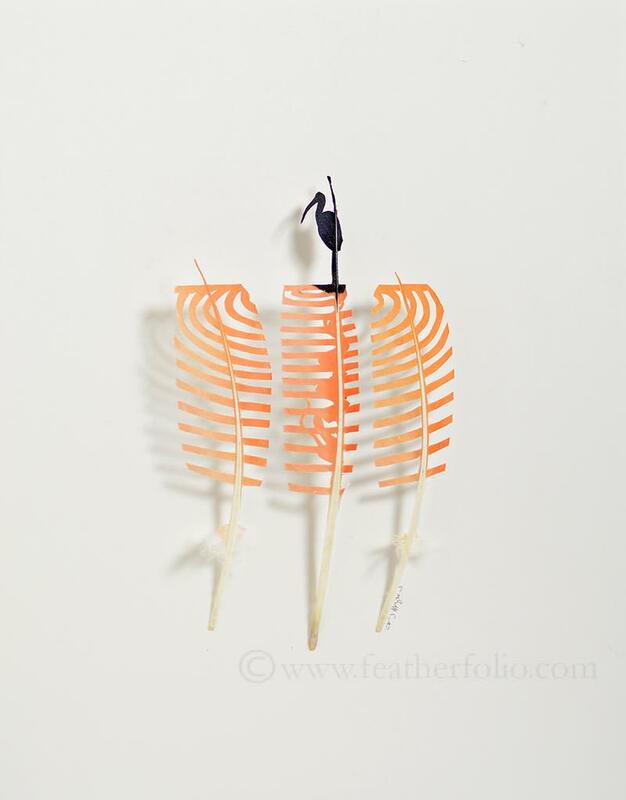 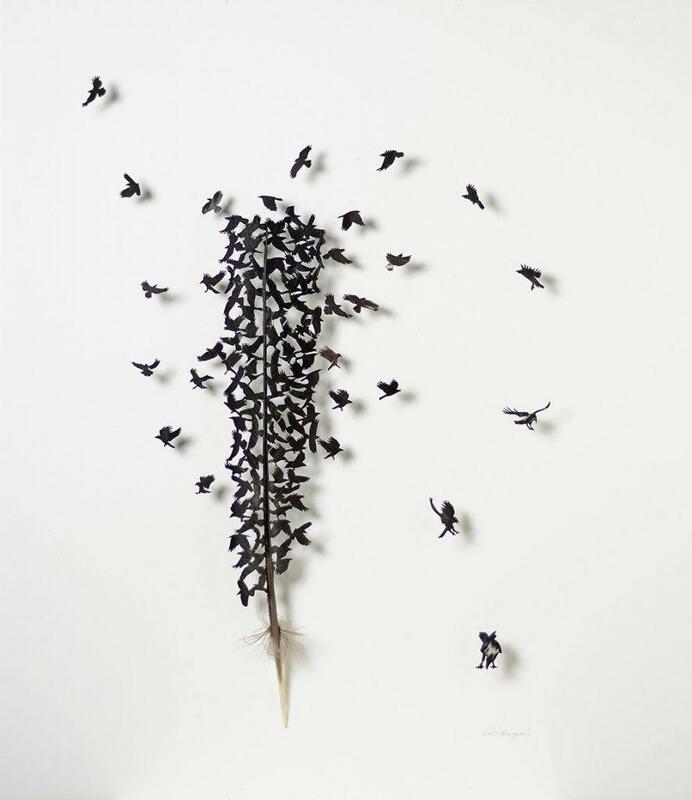 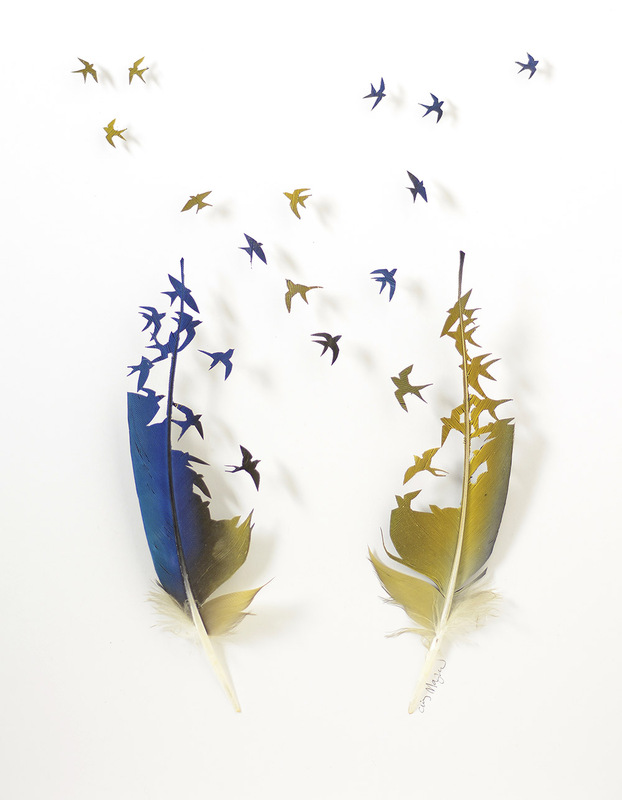 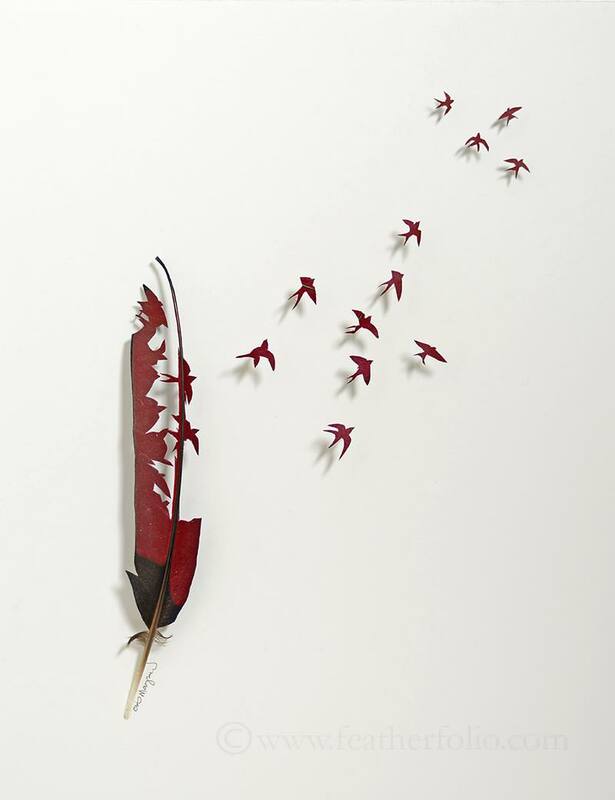 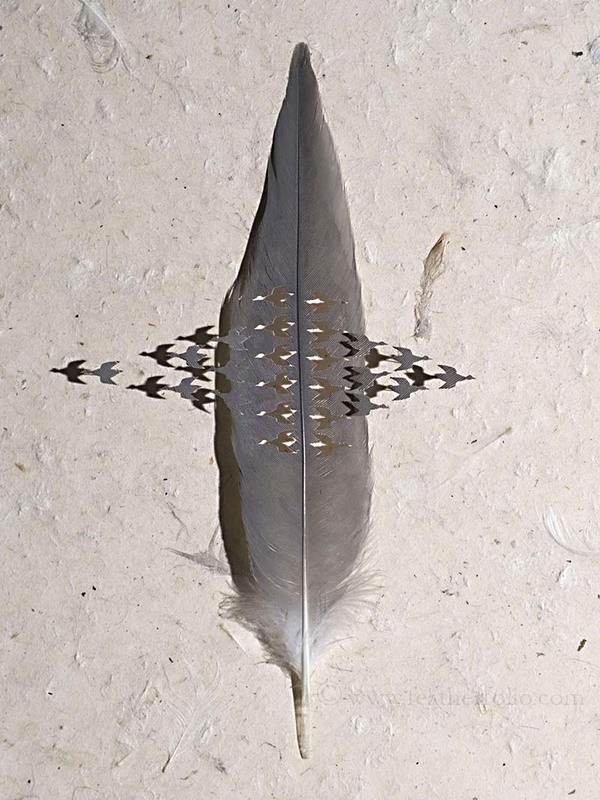 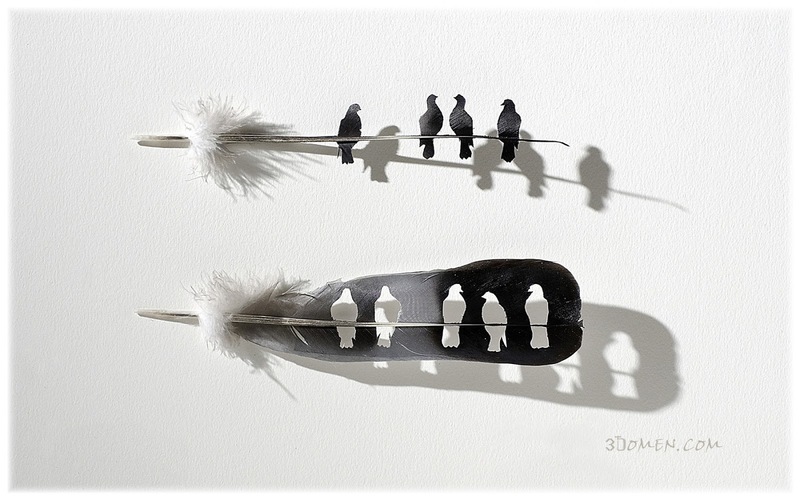 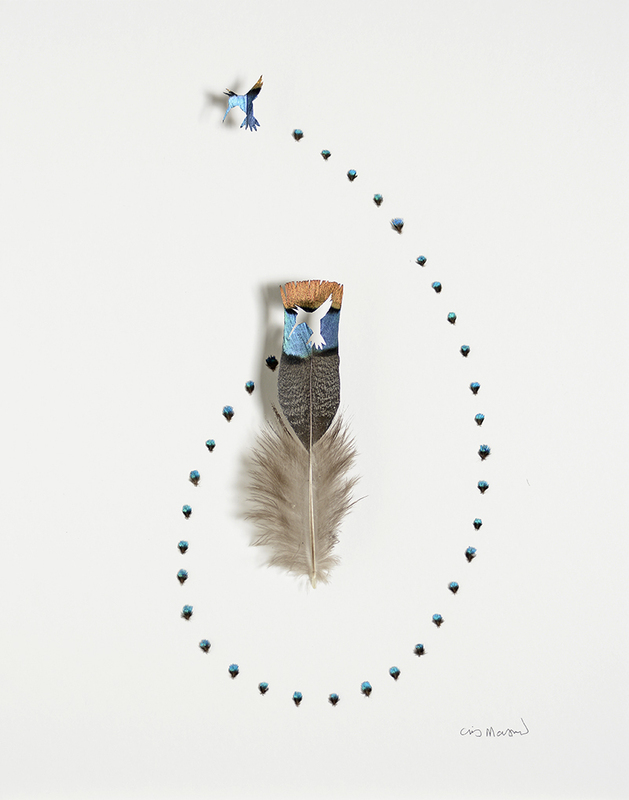 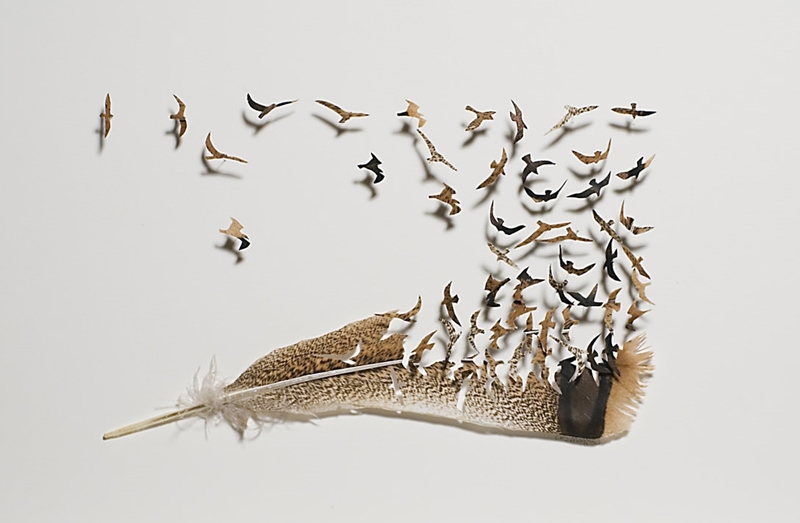 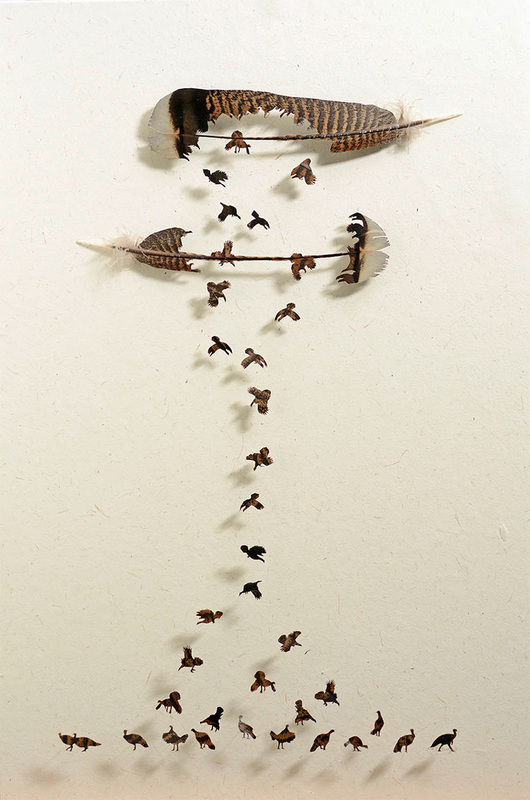 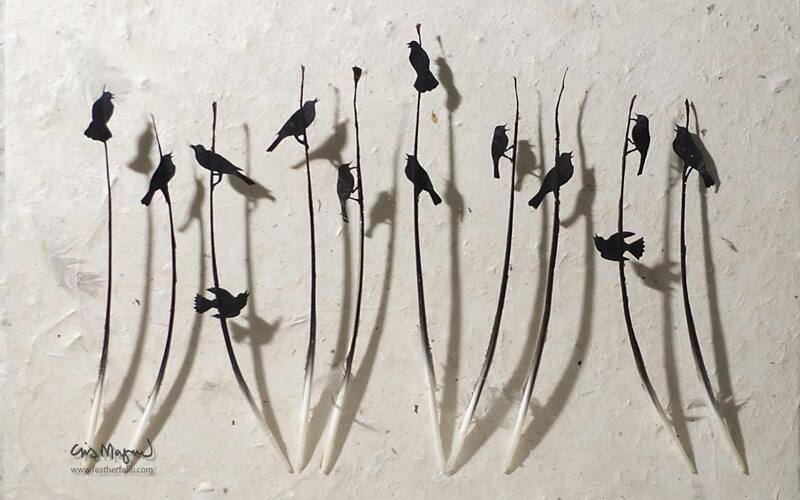 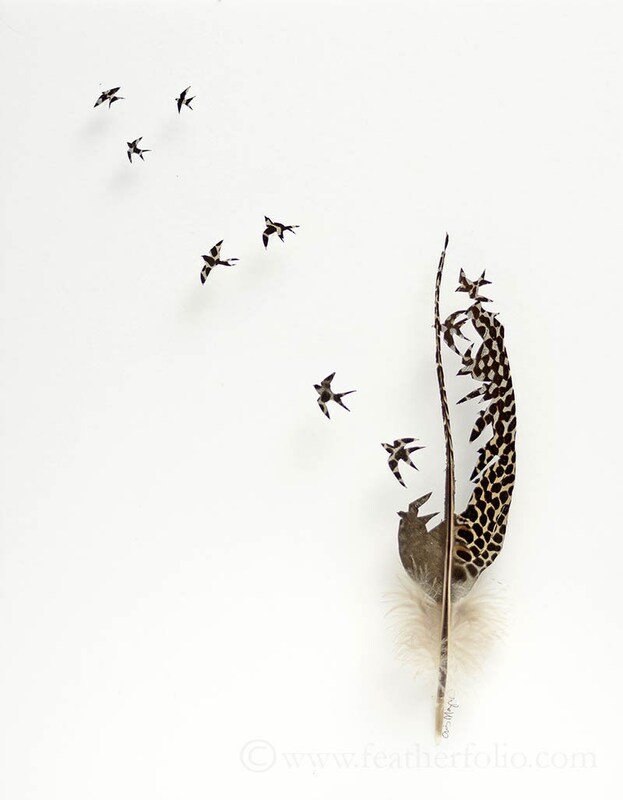 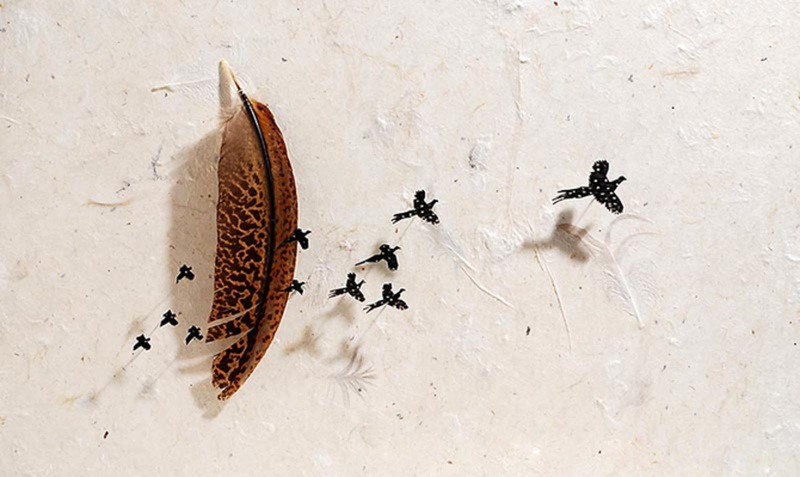 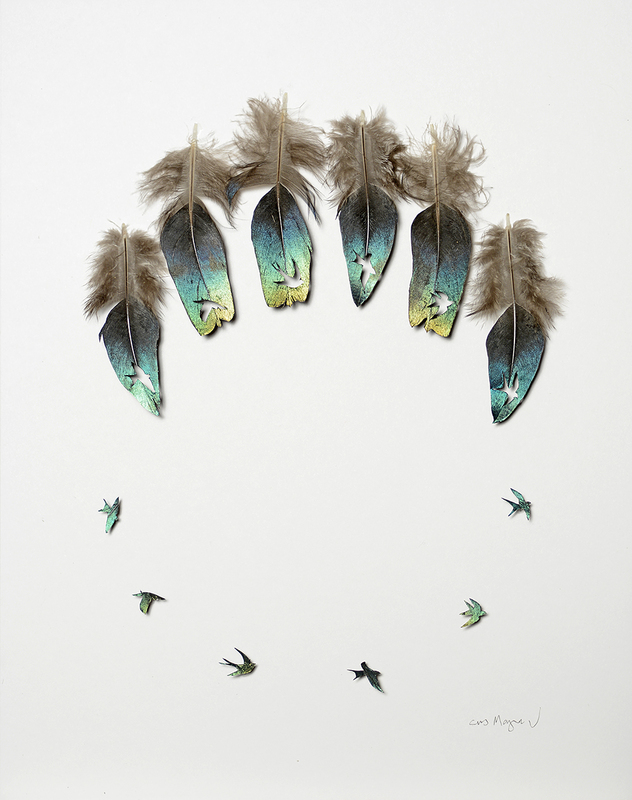 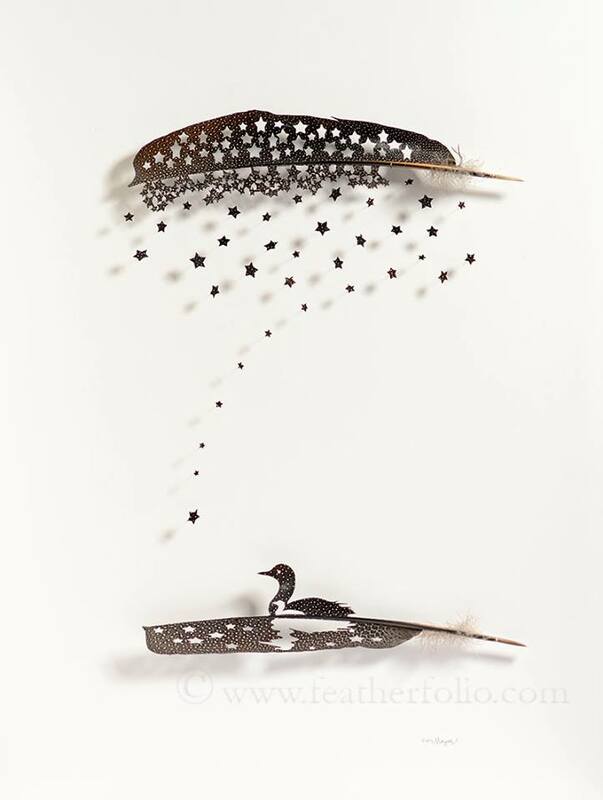 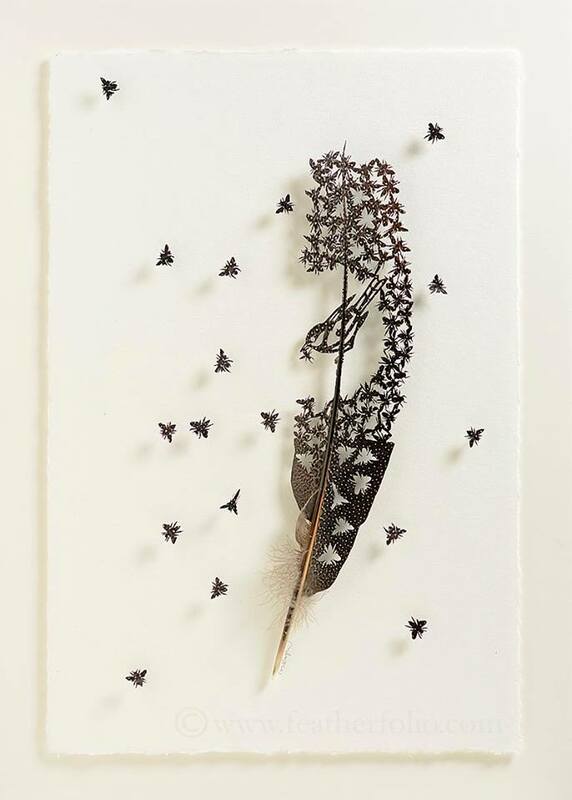 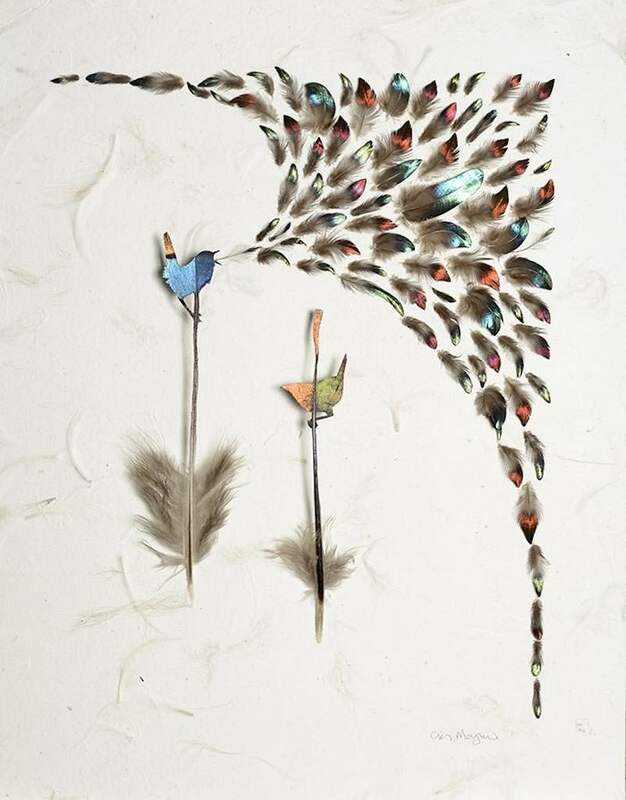 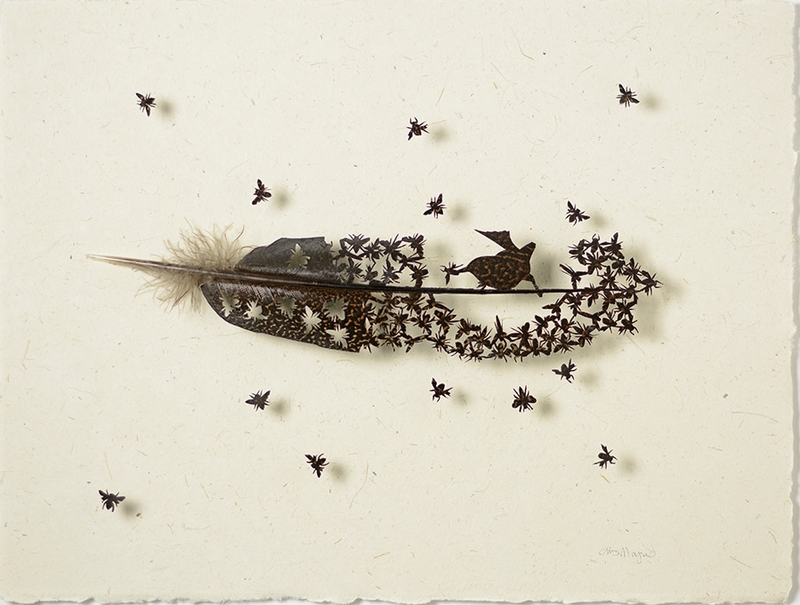 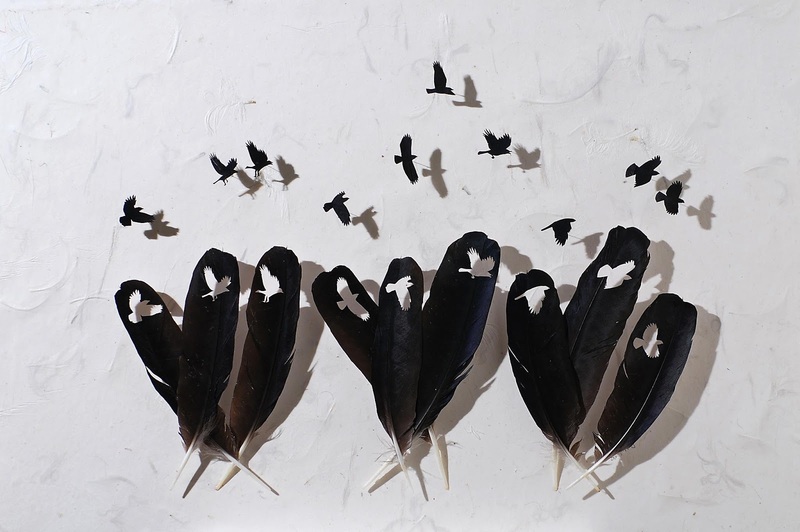 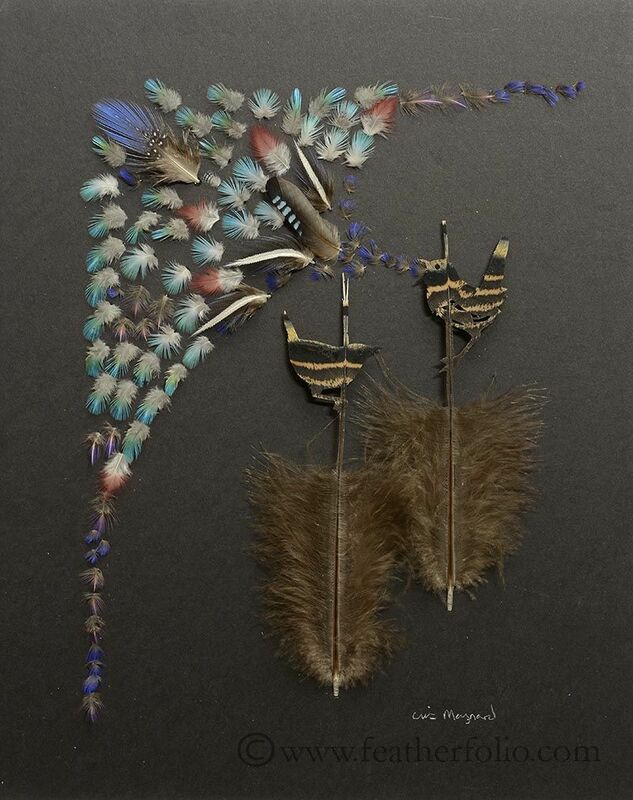 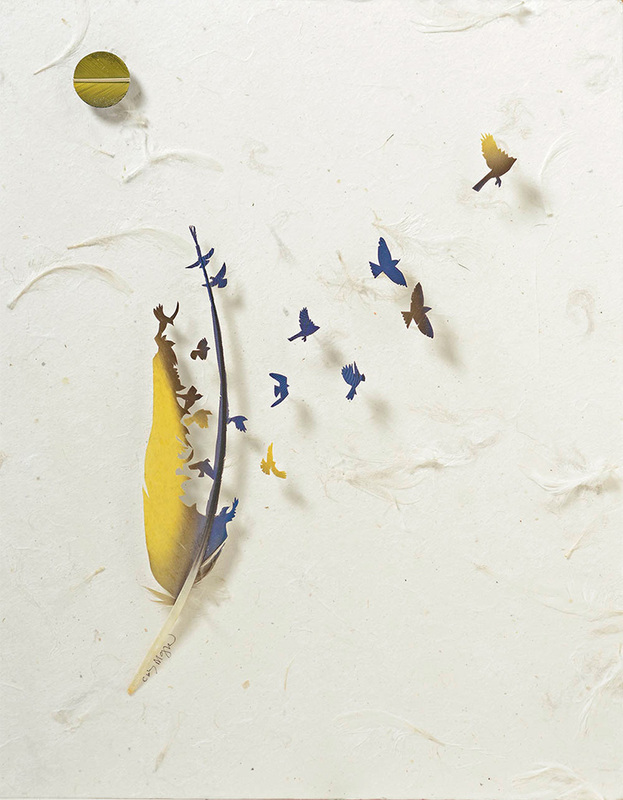 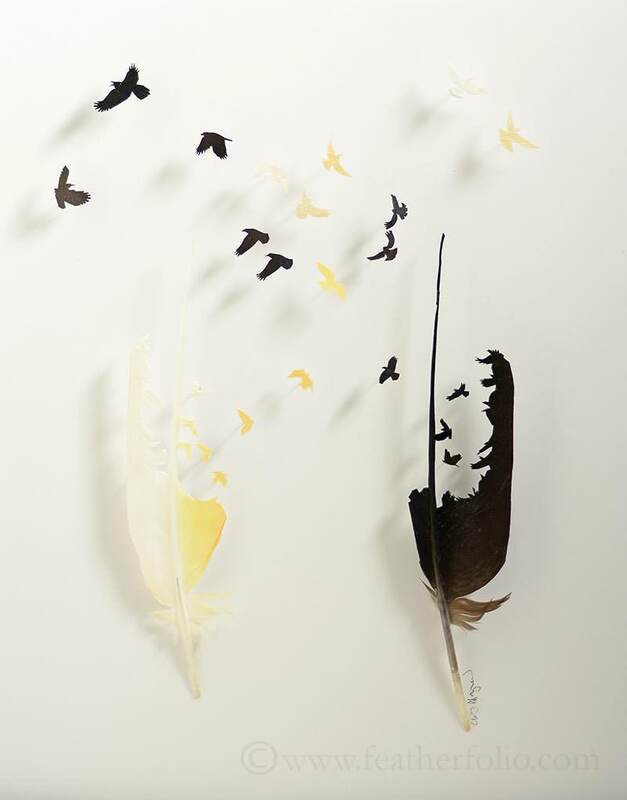 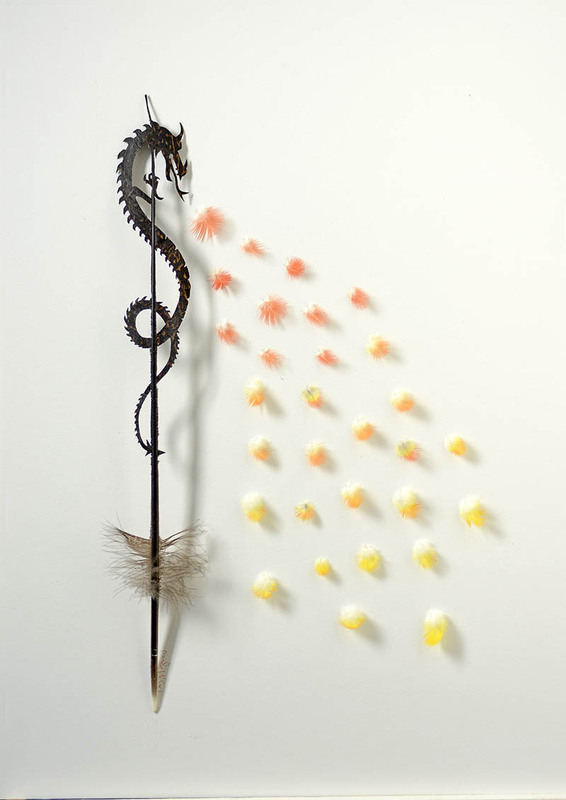 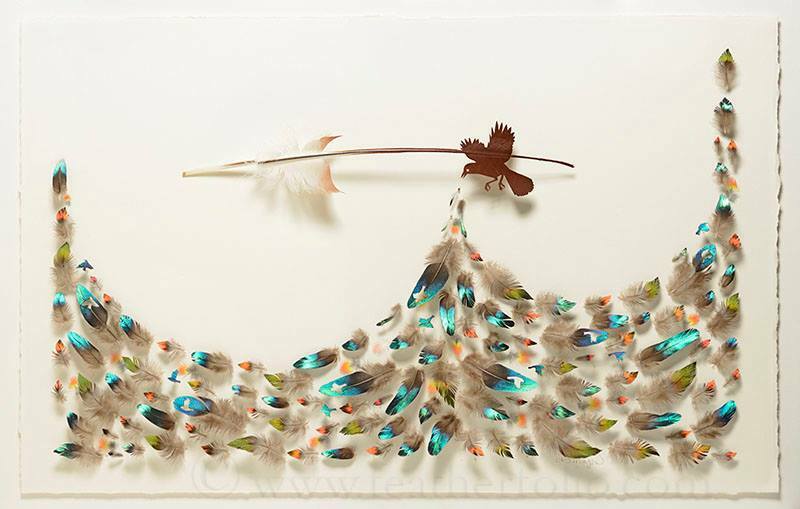 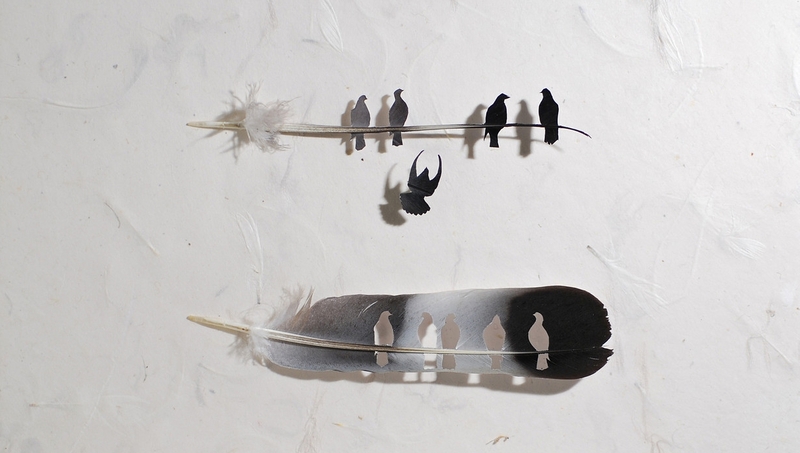 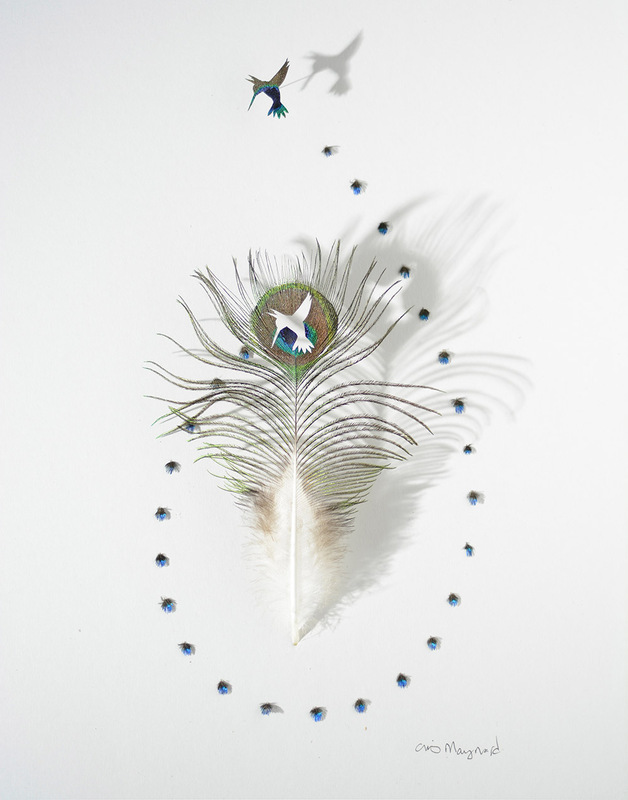 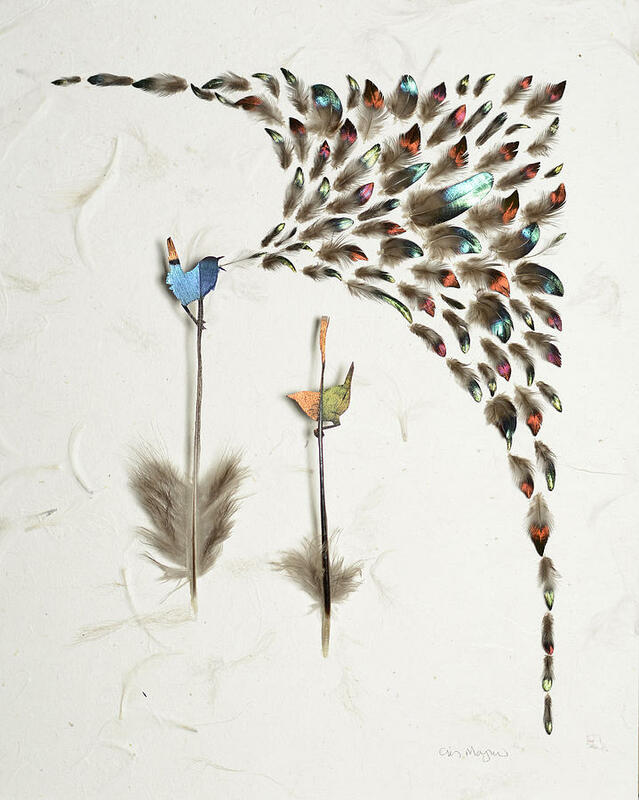 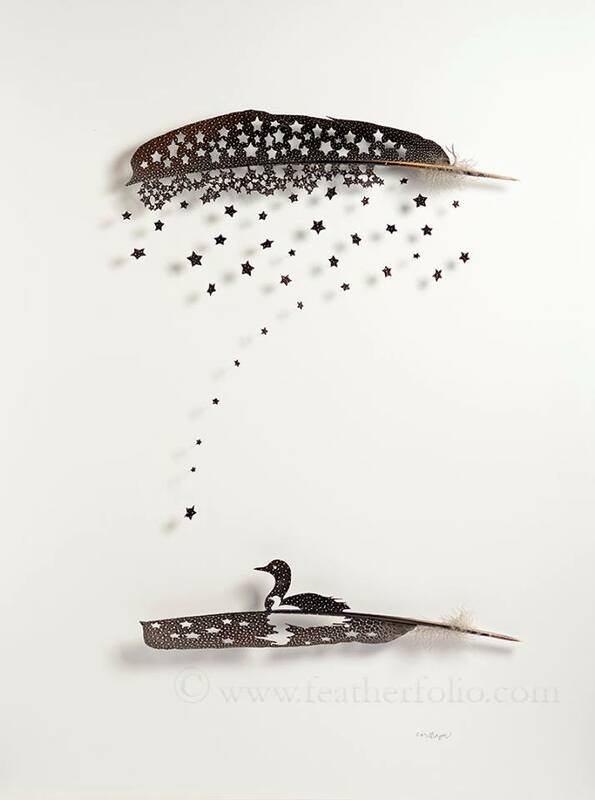 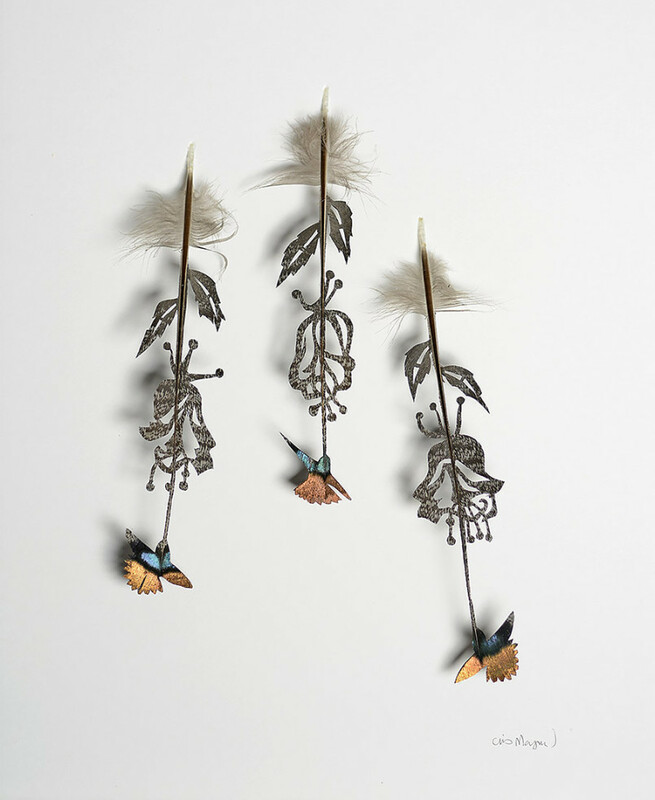 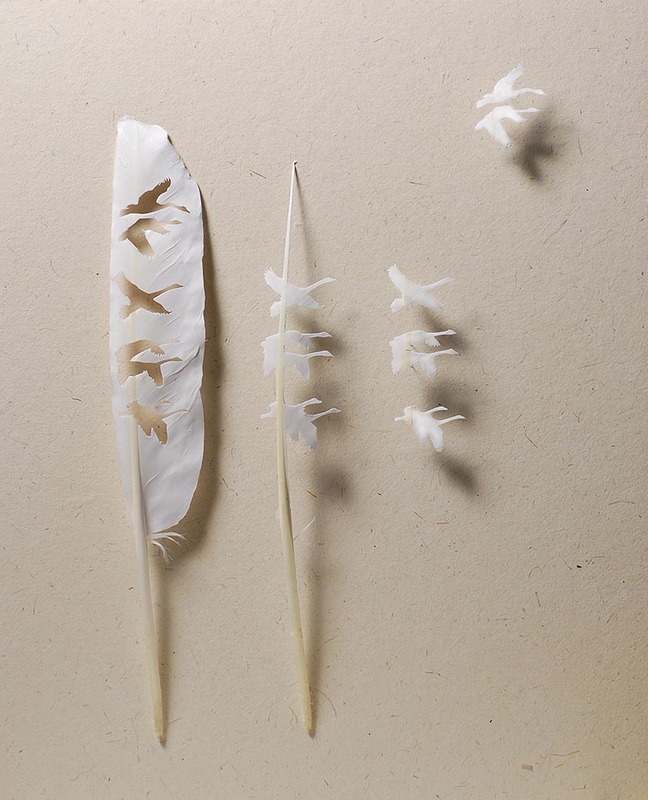 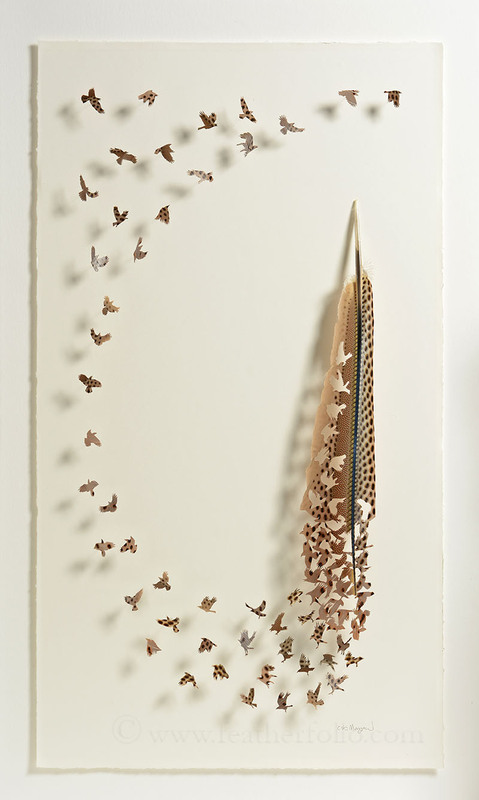 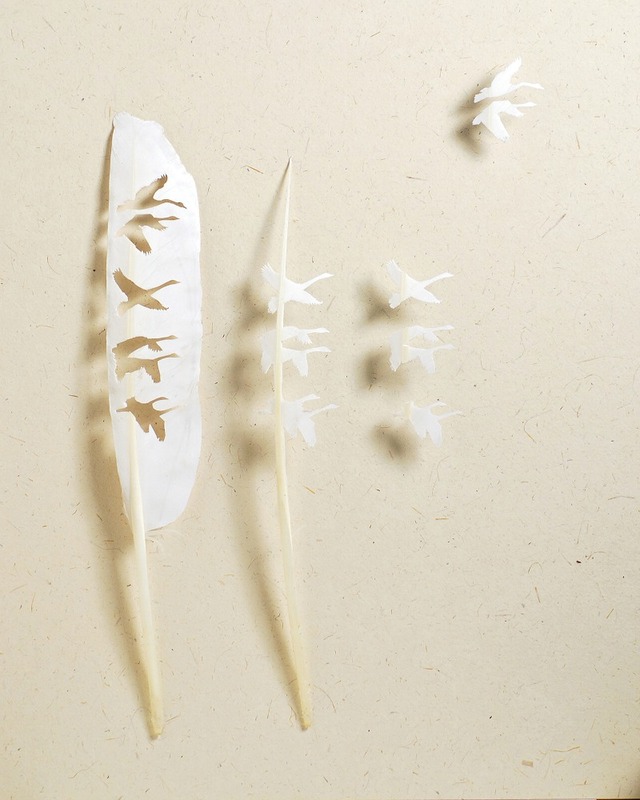 Chris Maynard is an American artist who creates delicate sculptural compositions using real feathers. 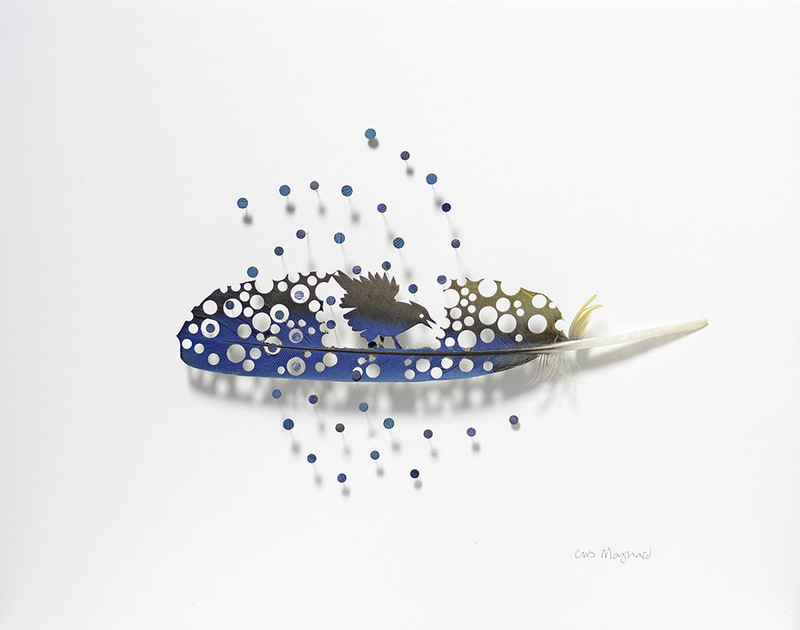 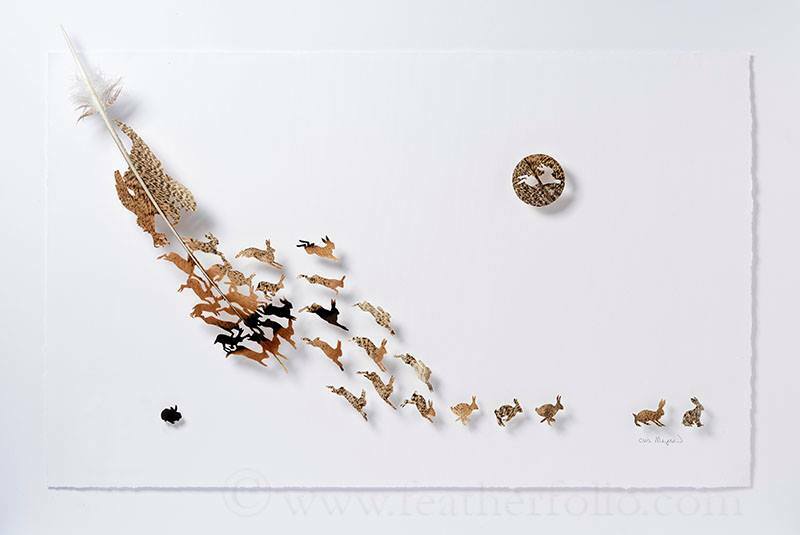 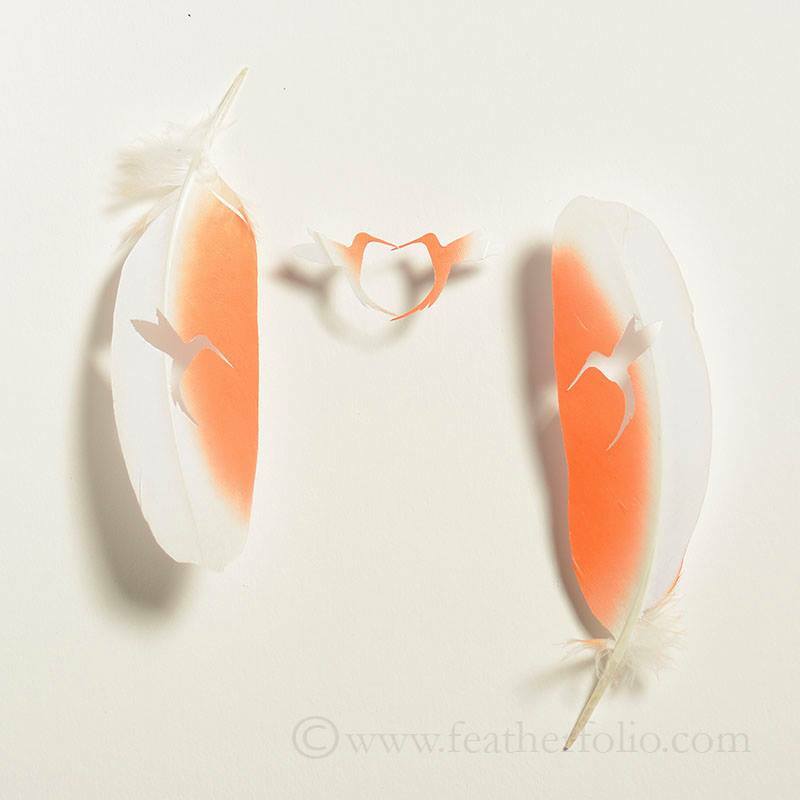 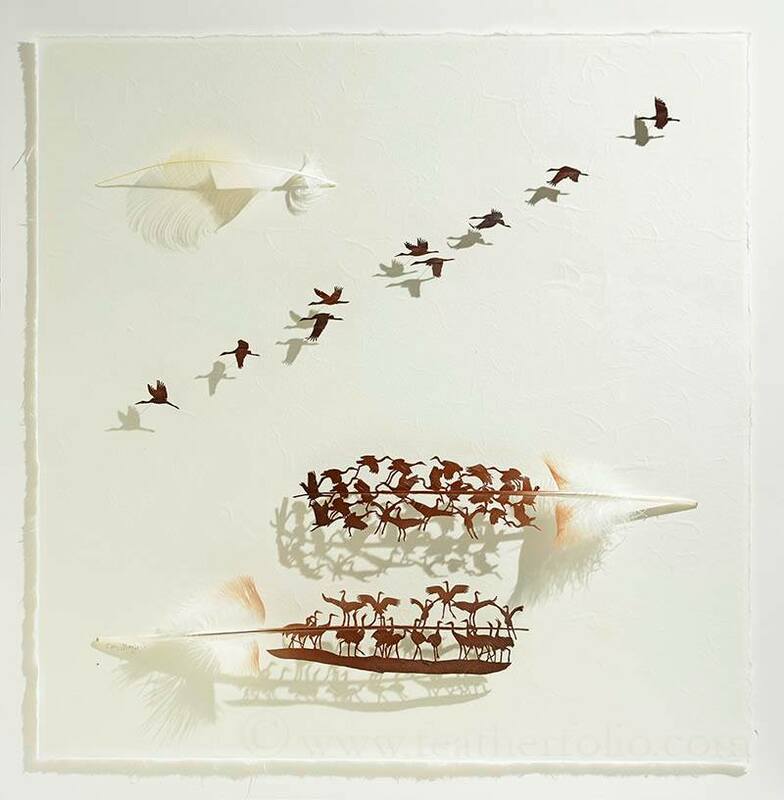 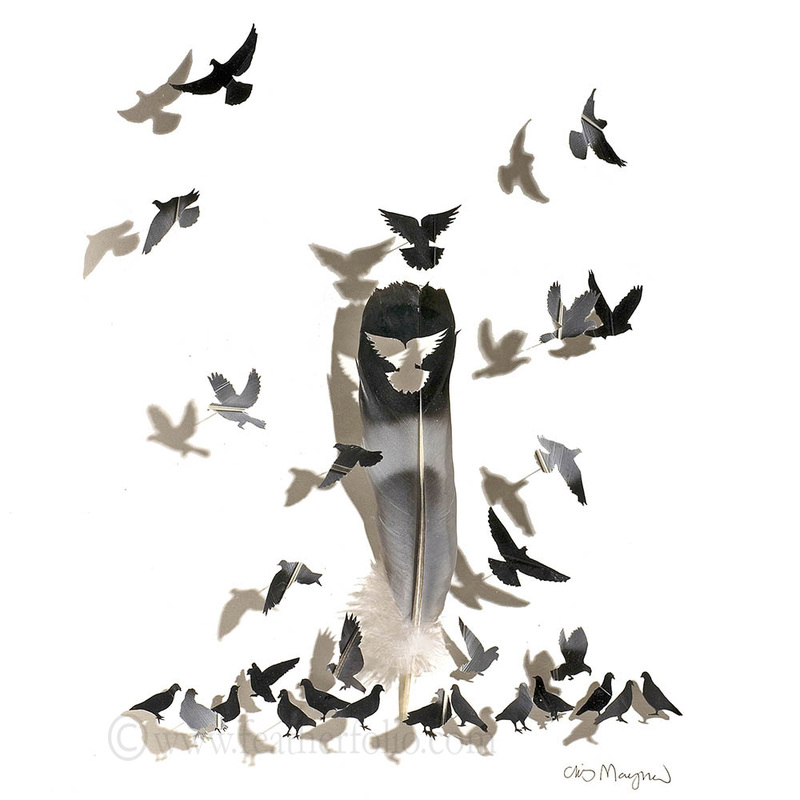 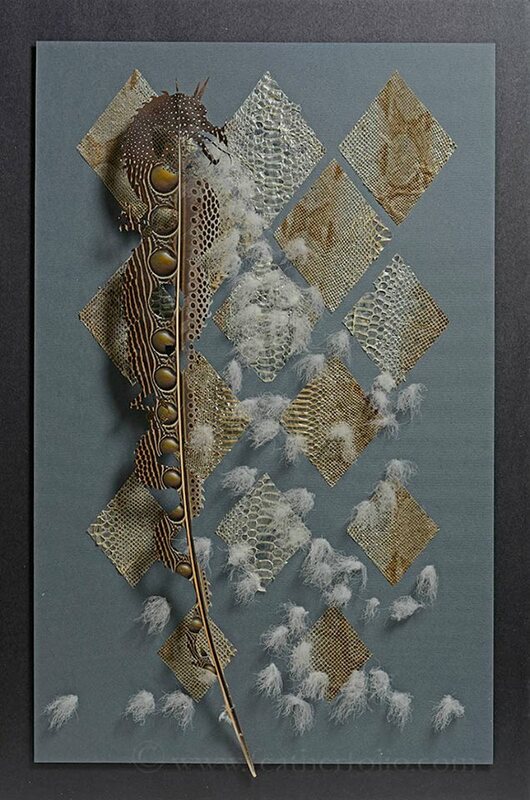 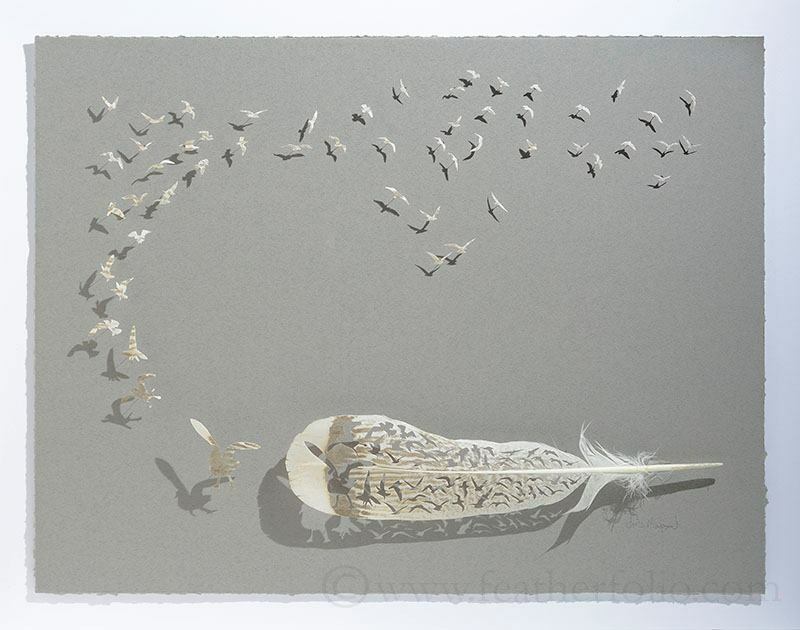 Chris Maynard has worked with feathers since he was 12 years old but only began showing his work in 2010. 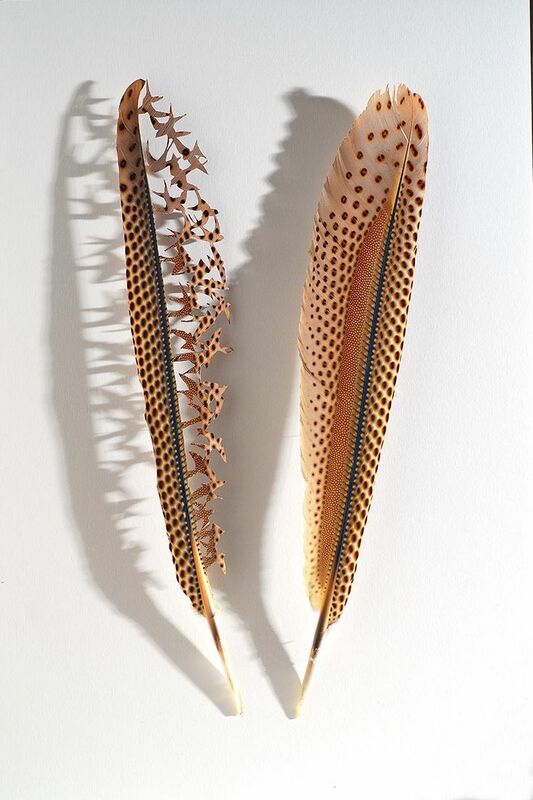 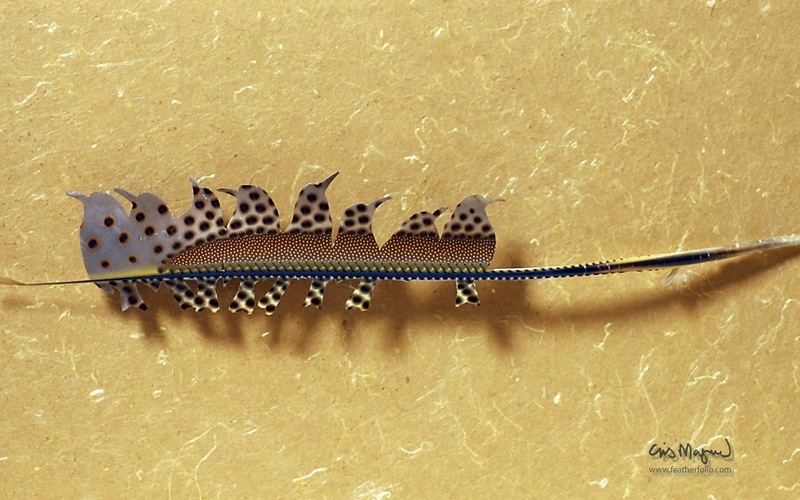 Chris Maynard combines his scientific knowledge, his artistic sense, and his love of feathers and life in a new art form. 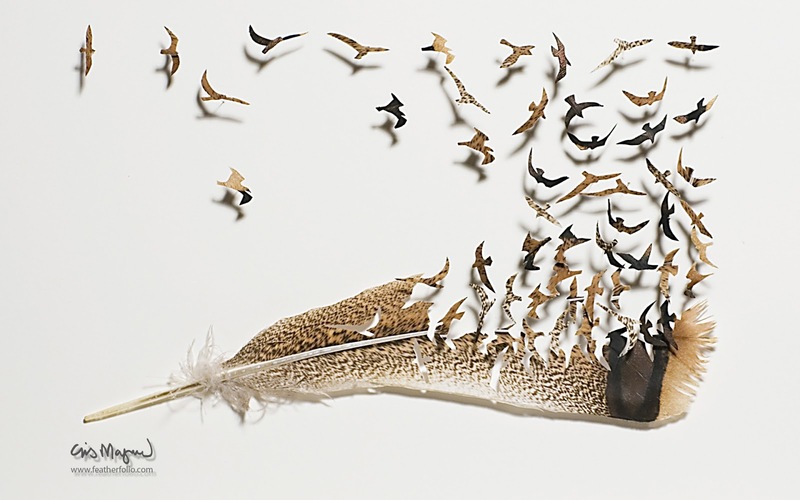 His message is one of beauty, appreciation of life-especially birds, and conservation. 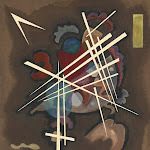 His inspiration originates mostly in his native northwestern United States though his themes appeal worldwide. 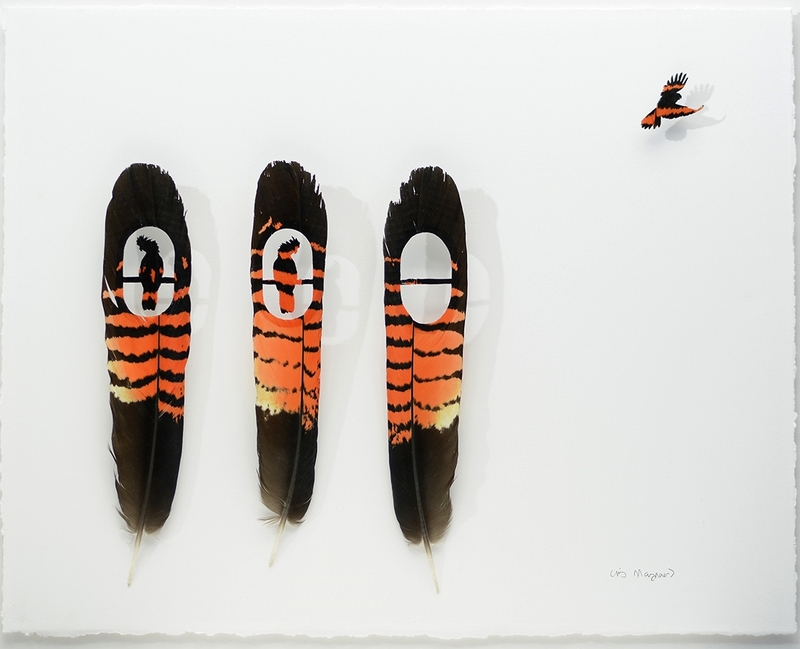 He is a member of Artists for Conservation and a signature member of the Society of Animal Artists. 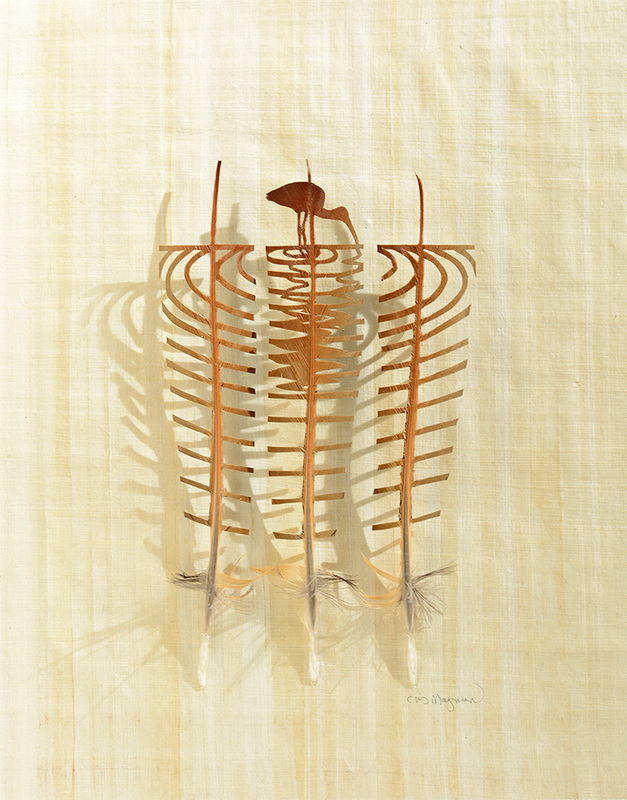 Maynard is represented by the Gerald Peters Gallery in Santa Fe, New Mexico, USA. 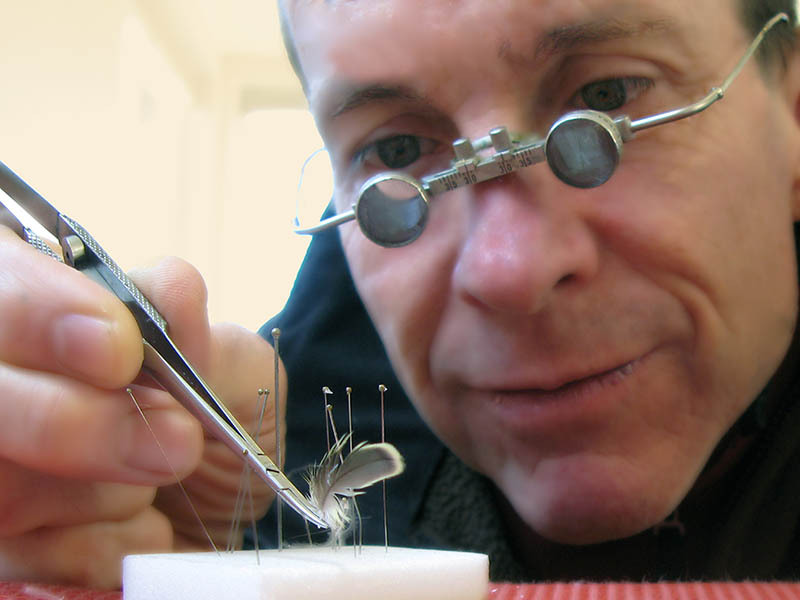 He applies various methods of art, design, and craft using surgery scissors, forceps, scalpels, and magnifiers to arrange feathers. 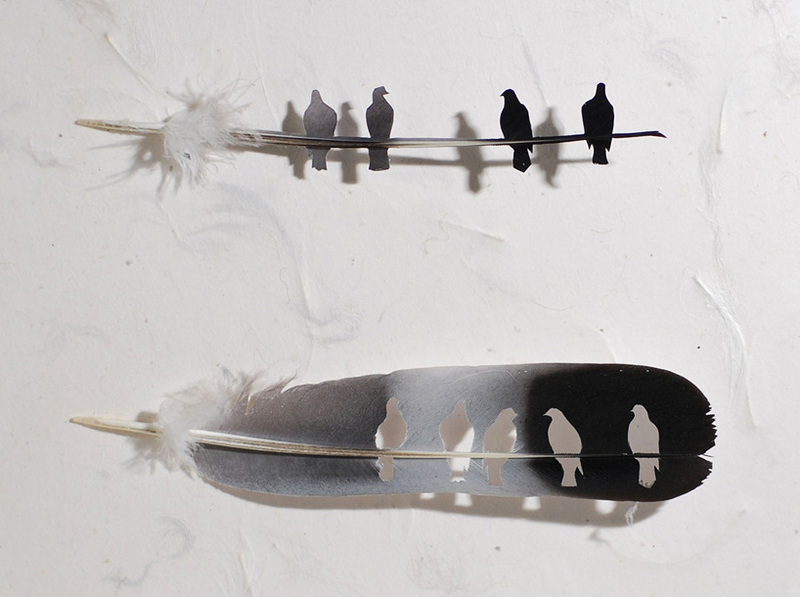 Since feathers are three-dimensional, Mr. Maynard aims to respect their form. 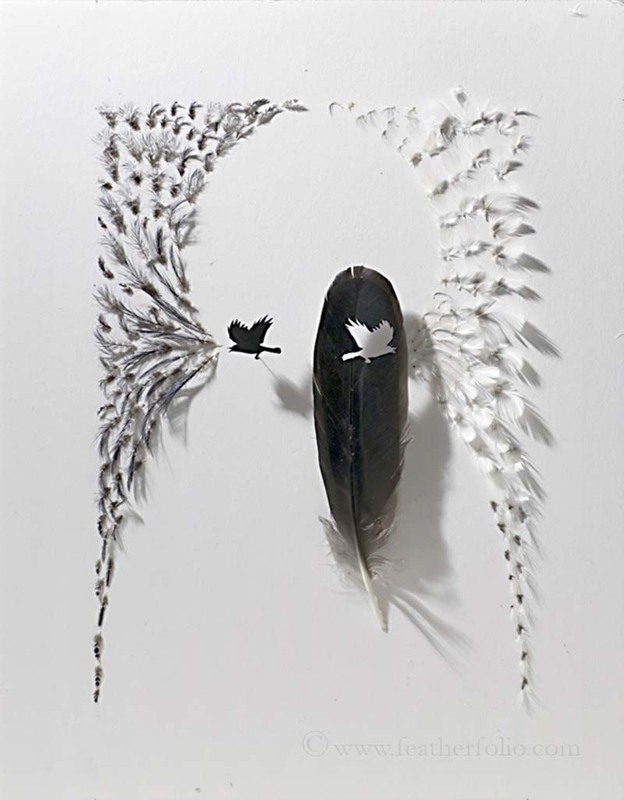 He does not paste them flat against a background but sets them apart so their curves and shapes are enhanced and doubly enhanced by placing them in shadowboxes so the feathers cast shadows and change according to the intensity, quality and direction of light. 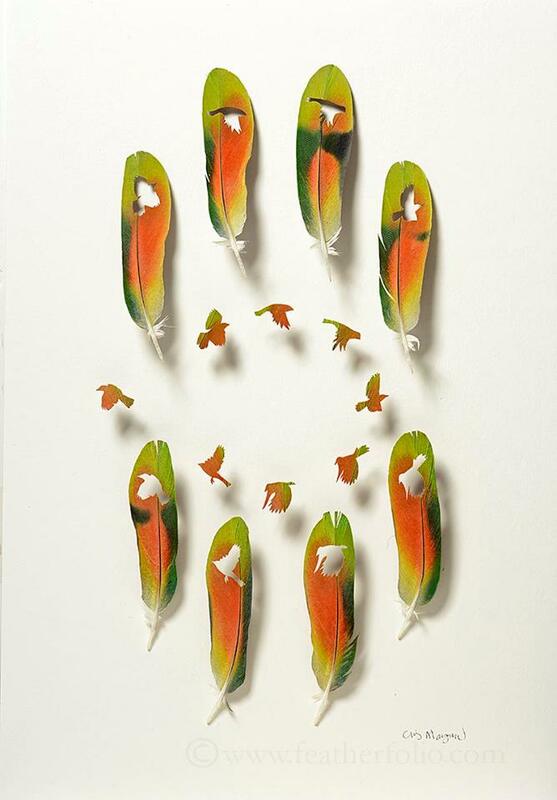 Unlike a painter’s palette, the choice of colors in feathers is quite limited. 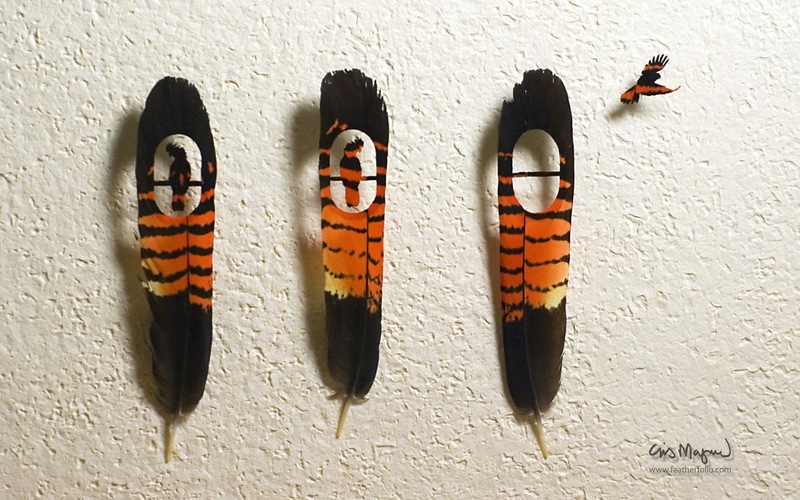 Nevertheless, Maynard keeps the natural colors and patterns of each feather. 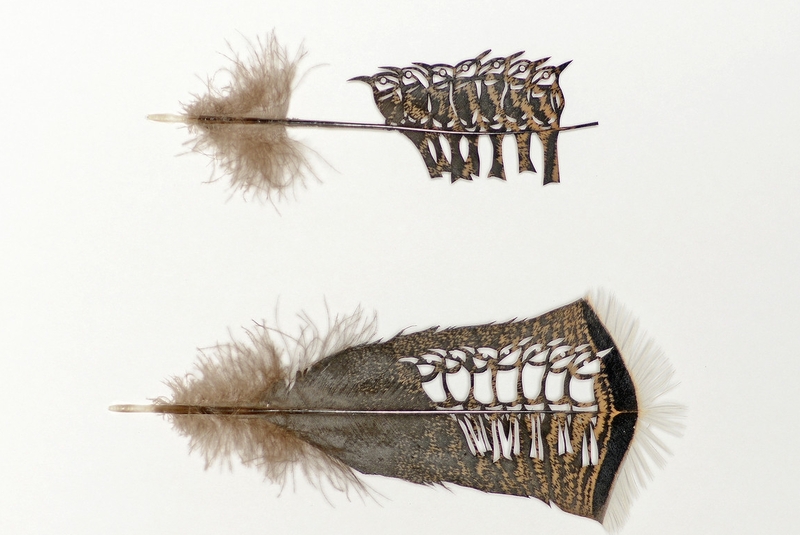 Feathers are often perceived as endearingly delicate, but they are actually quite tough, having to keep a bird clothed, sheltered, and in flight for a year or more. 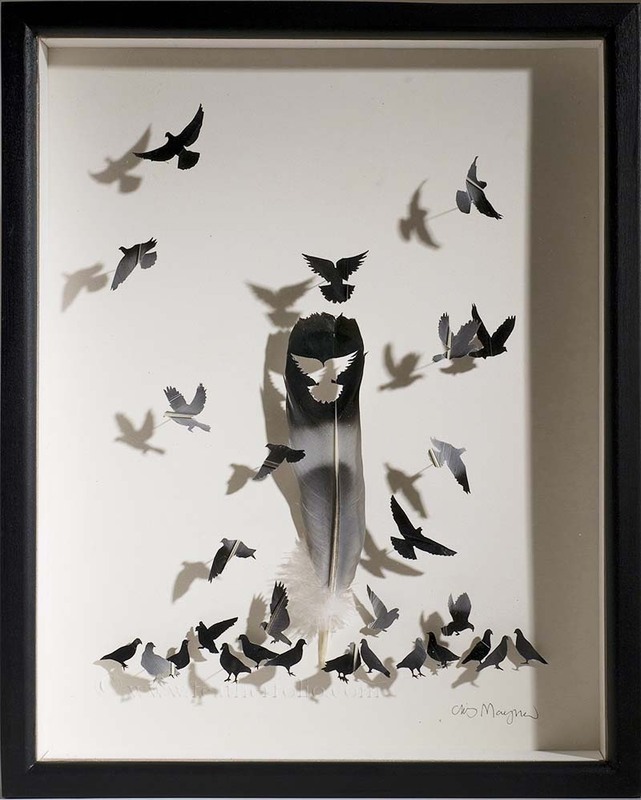 In the same vein, Mr. Maynard’s feather shadowboxes are meant to appear delicate but maintain their integrity for many years, just like a more traditional paintings using good quality materials. 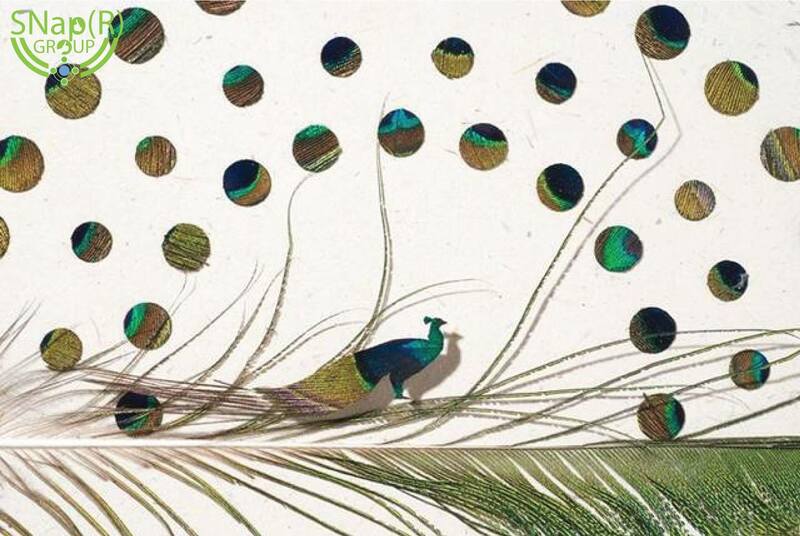 His sources for feathers are through an extensive network of private aviaries and zoos. 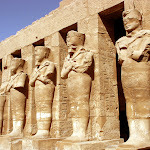 All are legal to have and sell. 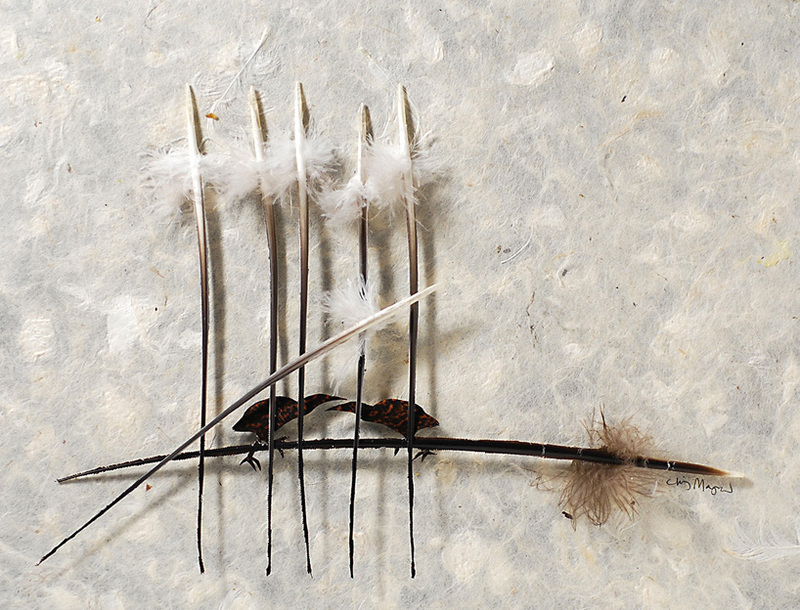 Most of the feathers he uses were naturally molted and many of the birds whose feathers he uses are still alive and well. 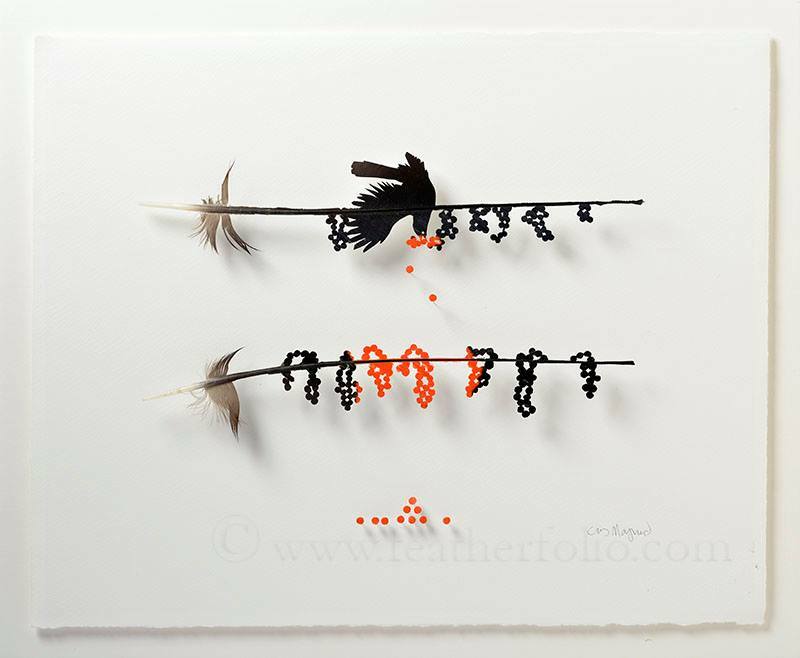 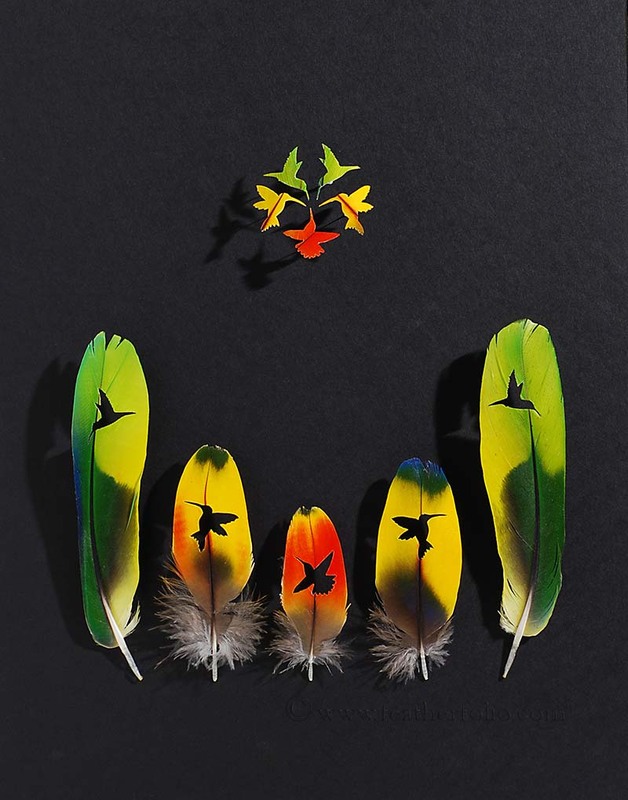 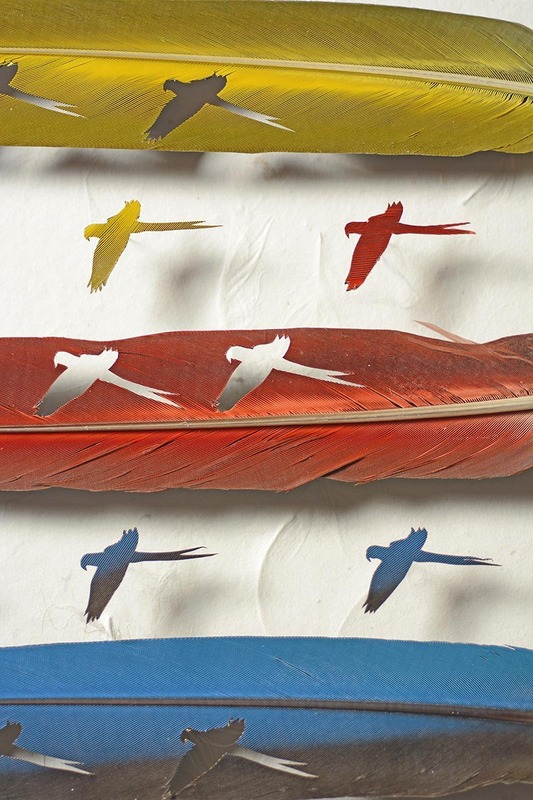 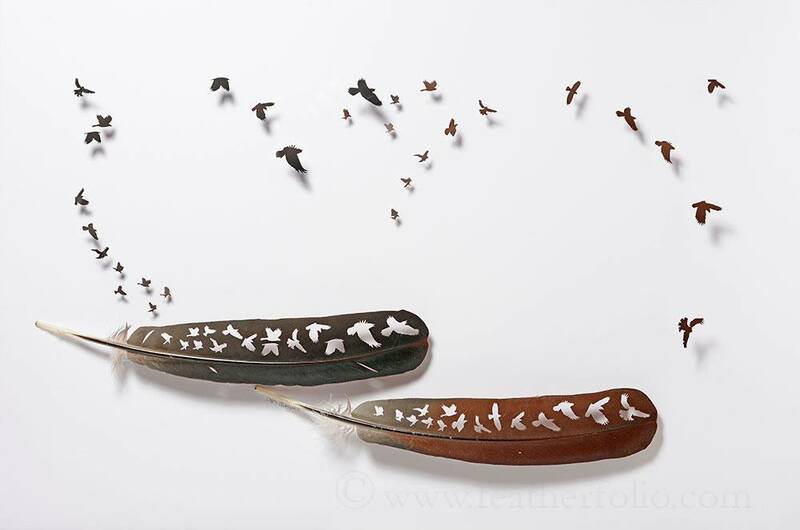 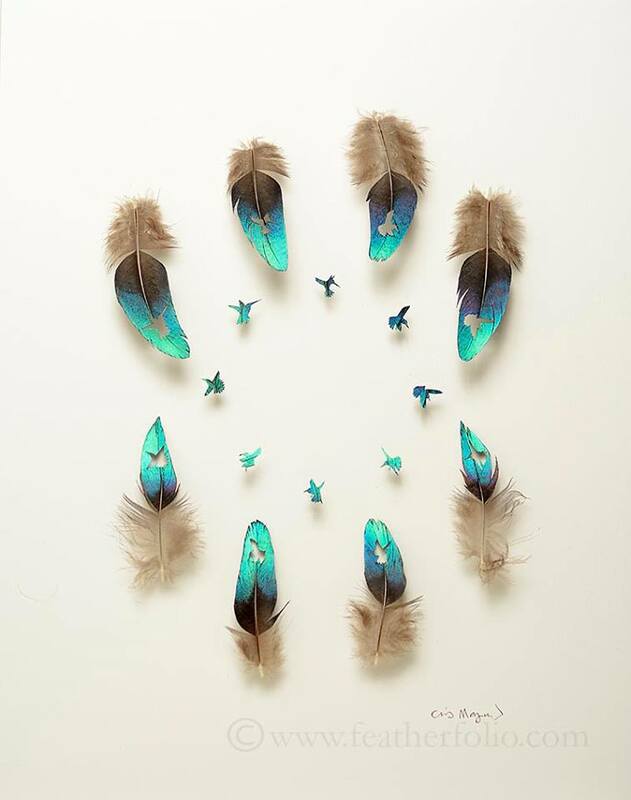 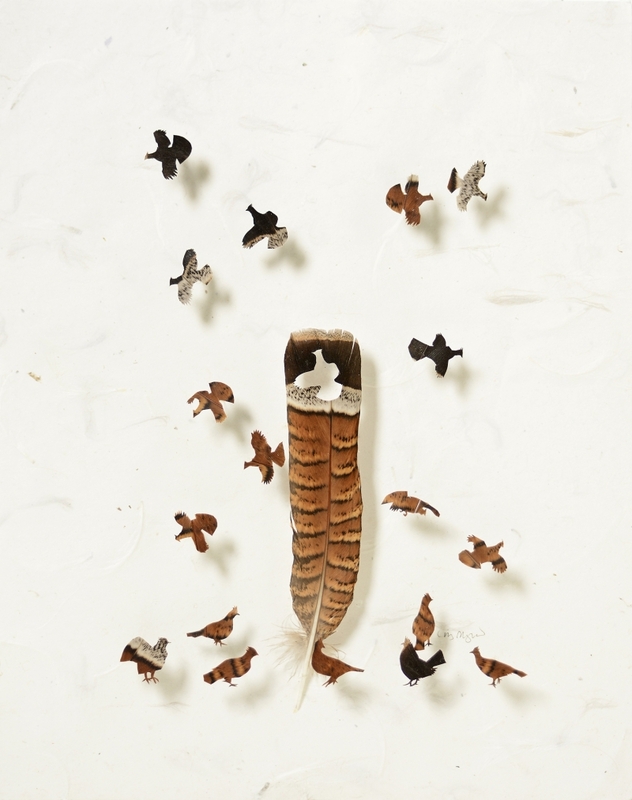 Since feathers can represent flight, transformance, healing, and a bridge between our present lives and our dreams, Mr. Maynard is grateful that his work with feathers has hit a soft-spot in the hearts of many people and cultures. 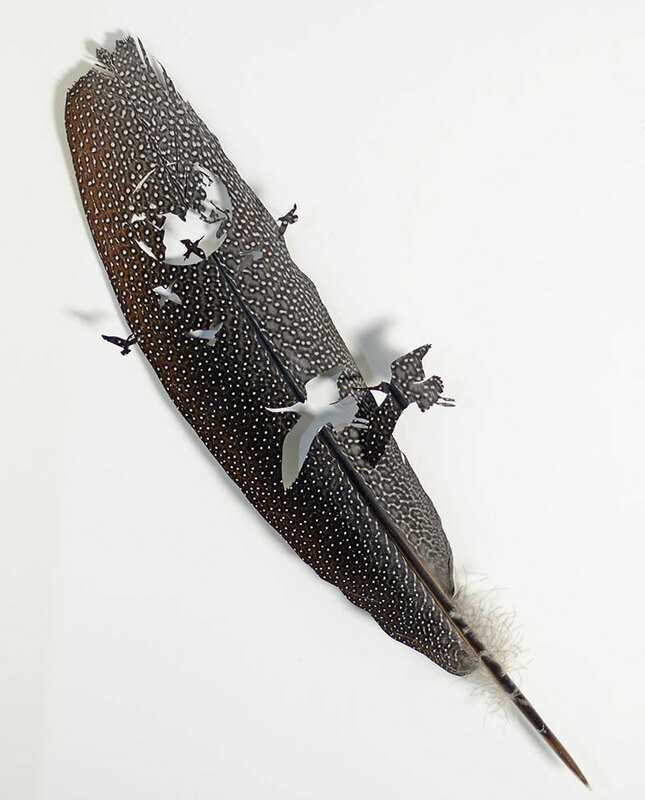 His work is in private collections in the USA and Canada, Asia, Europe, and Australia and has been featured in hard copy magazines and online around the world. 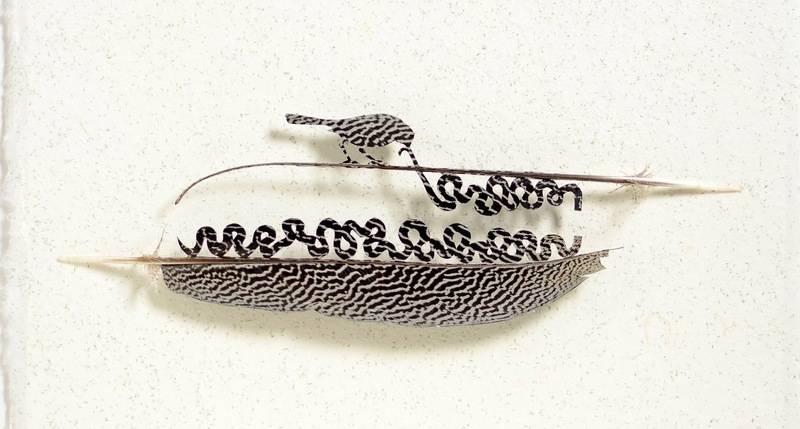 Chris Maynard è un artista Americano che crea delicate composizioni scultoree con delle piume vere. 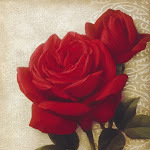 Maynard vive ad Olympia nello stato di Washington. 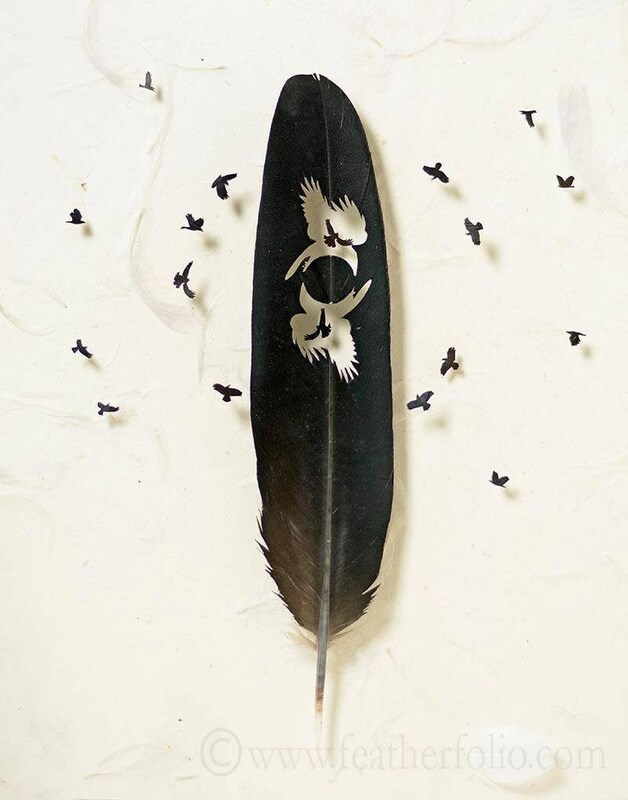 Maynard è stato affascinato dalle piume fin dall'età di 12 anni, ha iniziato a lavorare su di esse solo dal 2010, ed in soli quattro anni è riuscito a guadagnarsi popolarità in tutto il mondo, attirando l’attenzione di collezionisti e stampa. 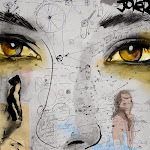 The Golden Scope ha quindi deciso di analizzare le opere di Maynard dato che sia il processo che segue per realizzare i suoi pezzi, che il materiale utilizzato -piume- sono assolutamente unici. 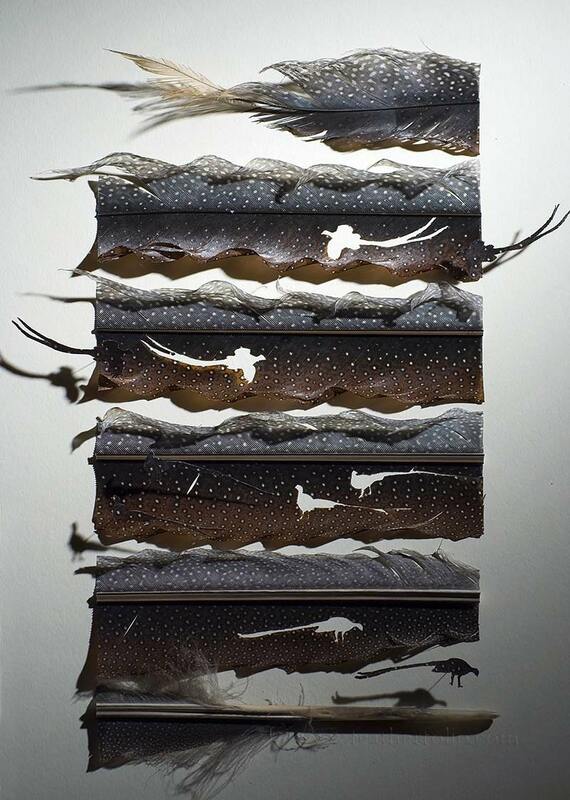 Maynard è convinto che "Le piume rappresentano l’apice della natura: l’intersezione di funzionalità e bellezza. 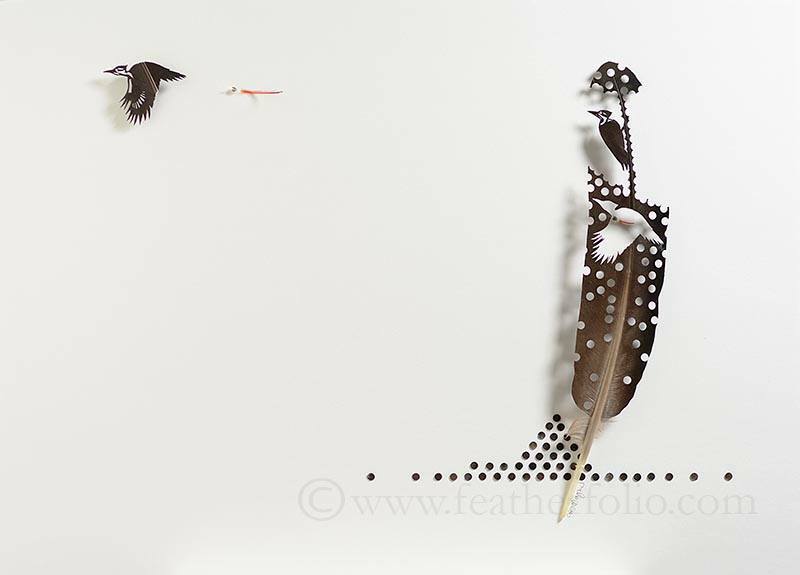 Rendono possibile il volo degli uccelli, li isolano da acqua, sole e vento, ed i loro colori e la loro forma li aiutano sia a nascondersi che ad attrarre i compagni". 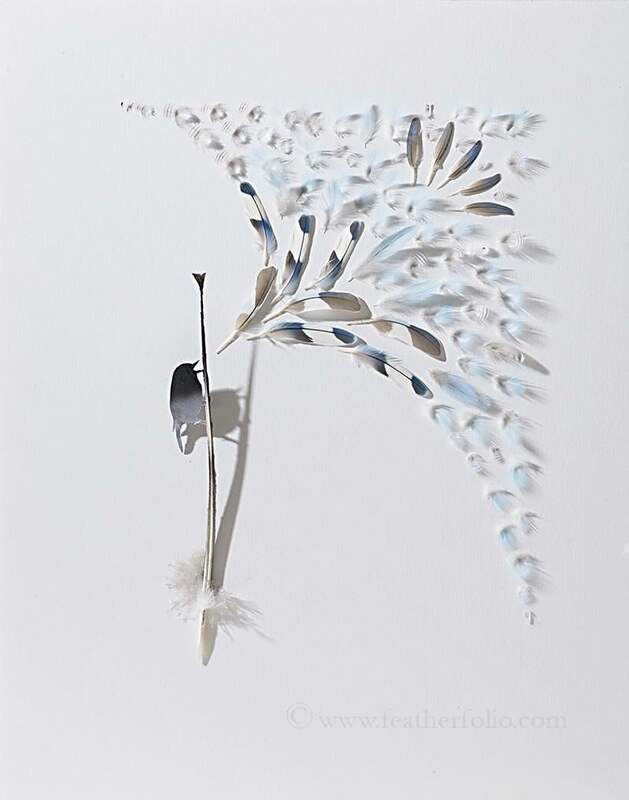 Secondo l’artista "Ogni piuma è un pò un piccolo esempio di perfezione. 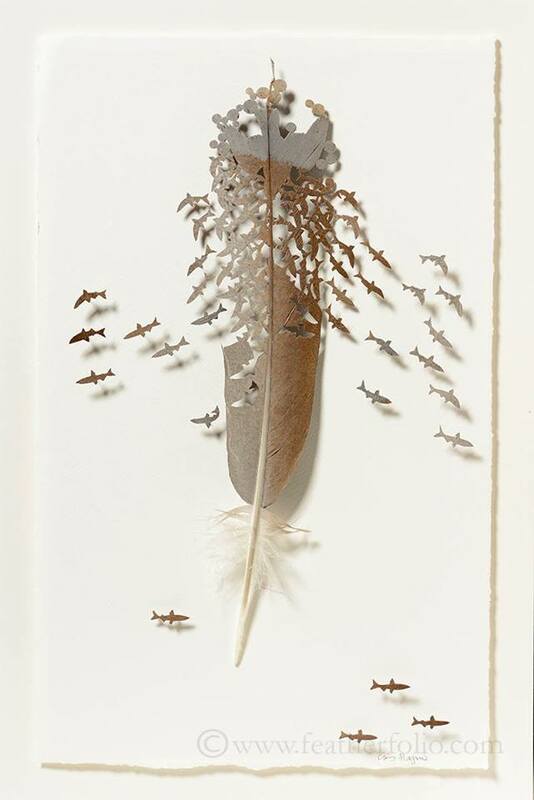 Quando gli uccelli cambiano le loro piume ogni anno, io le riciclo nella mia arte […]. 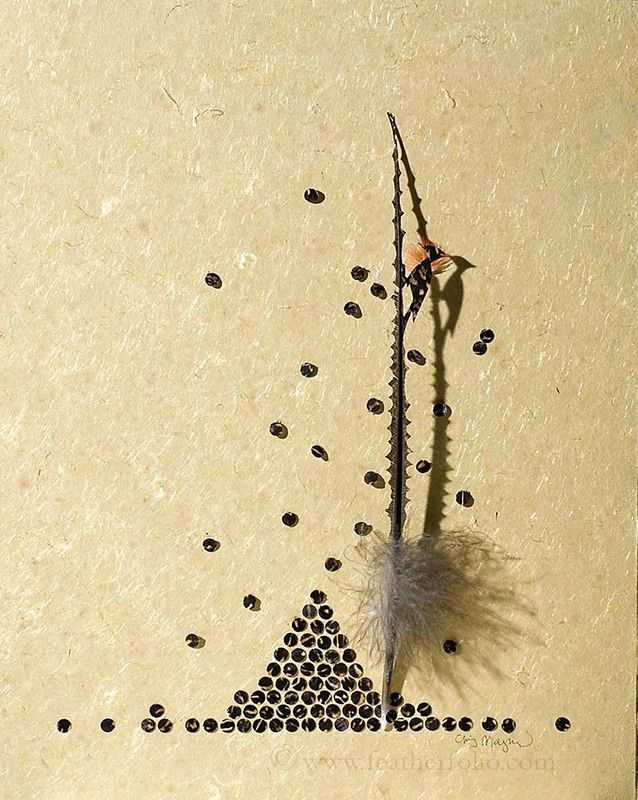 Il mio lavoro con le piume mi dà una dimensione soddisfacente dalla quale guardare il mondo". 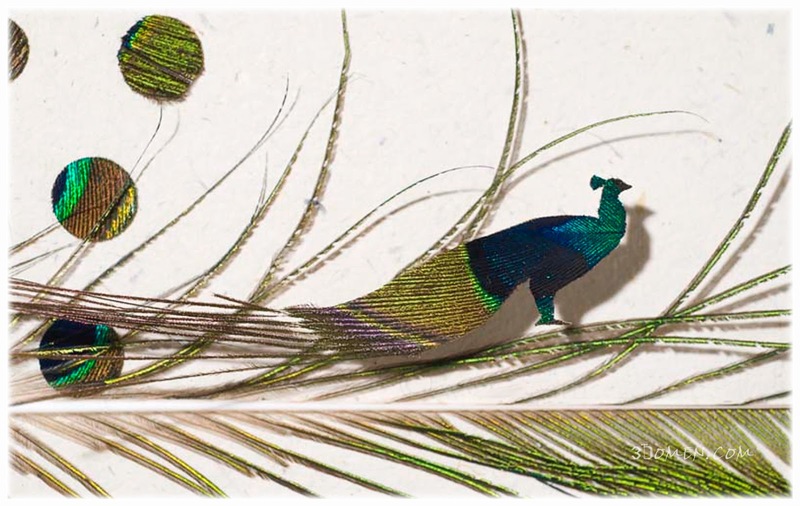 Gli strumenti da lui preferiti per realizzare le sue incredibili opere d’arte sono minuscoli “attrezzi” per la chirurgia, forbici, pinze, e lenti d’ingrandimento tramandate attraverso la sua famiglia.